We chose just two colours each to create our watercolour effect drippy figures. 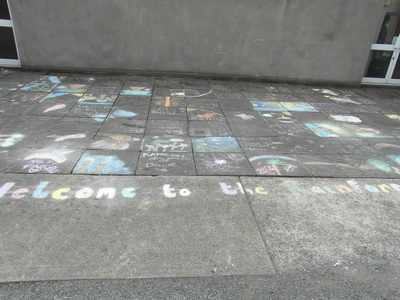 The message: lots of water and very little paint! 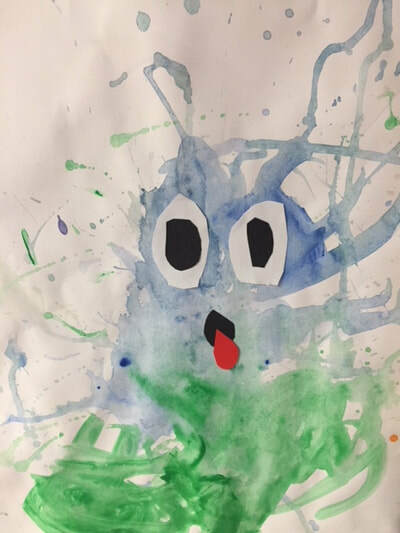 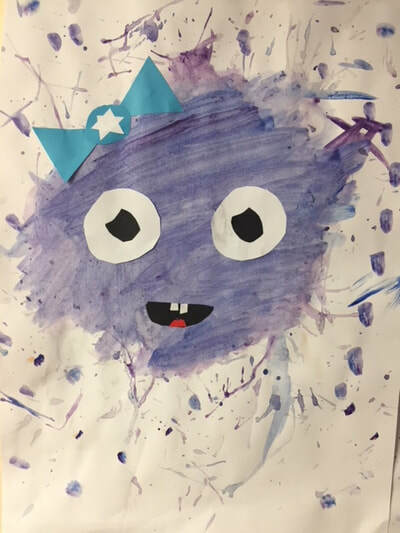 We let the paint dribble and drop and we tried some blow painting too. 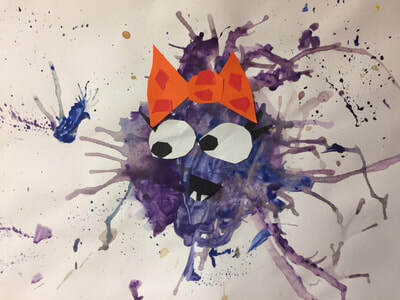 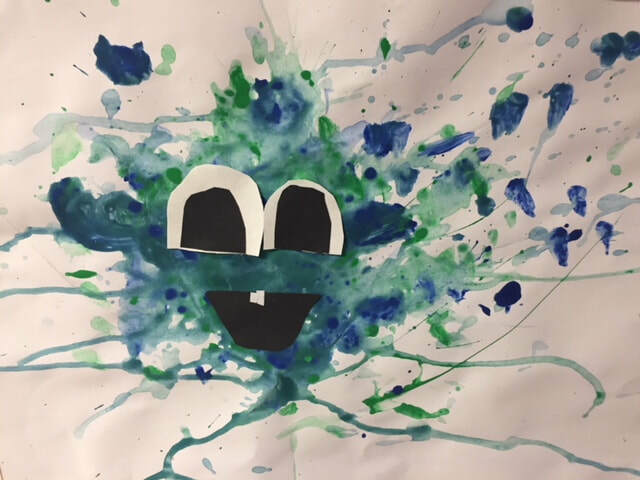 When dry, we turned our drippy figures into right little monsters! What a mess! Jackson Pollock's paintings look careless and unplanned, but in fact they are not. 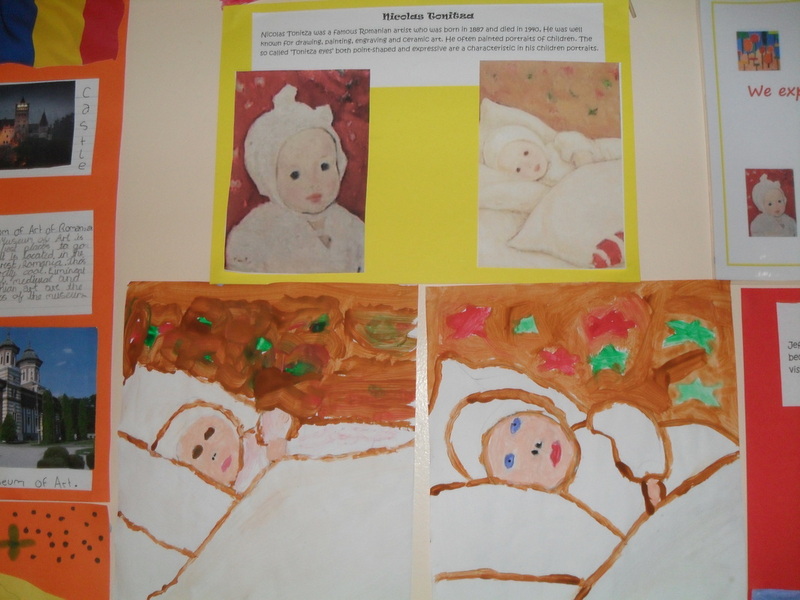 He took great care over where the paint would fall and which colours to use. 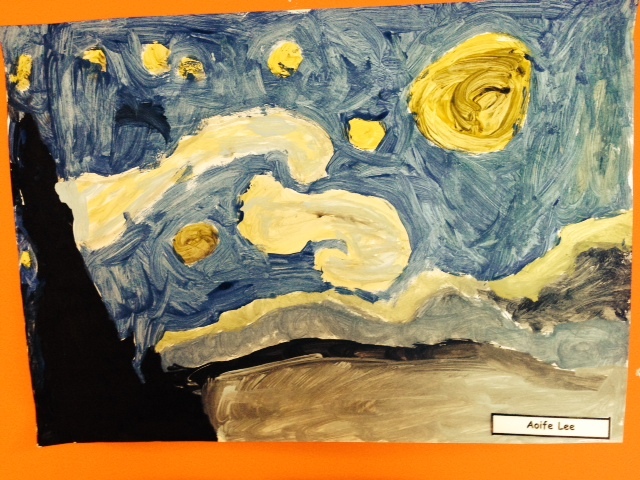 With a flick of his wrist he let the paint fall off his brush in loops and swirls, splat onto the canvas. 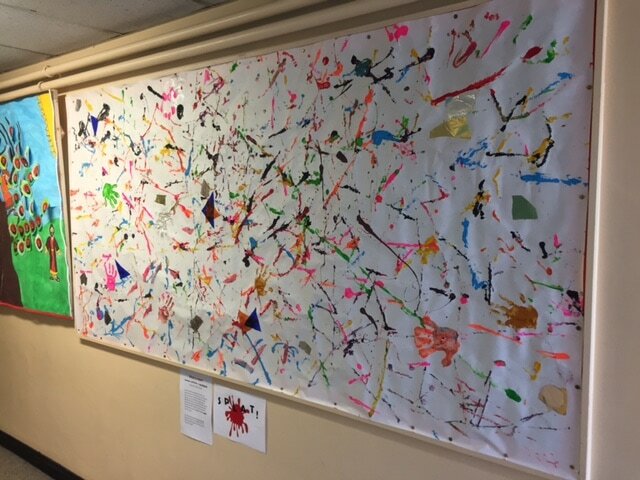 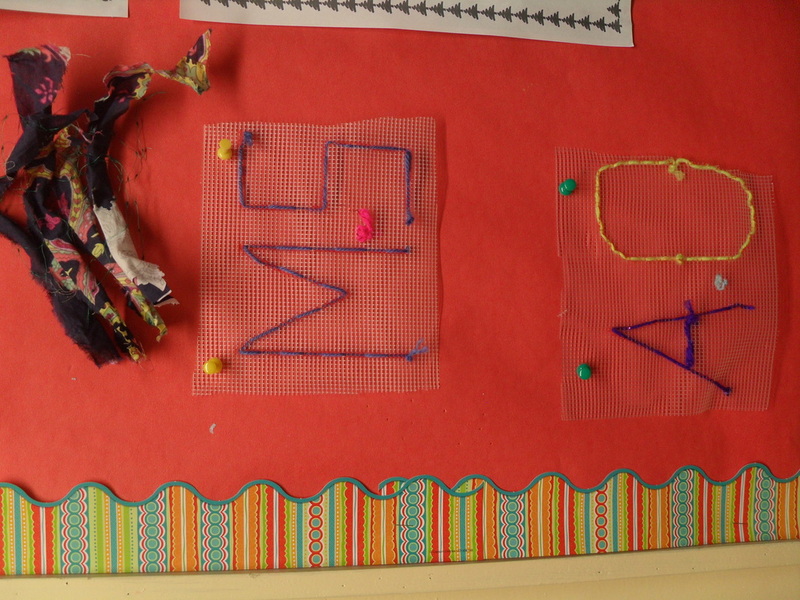 We recreated our own Pollock inspired piece using Styrofoam balls, paint and brushes. We then added some extras...just for fun! 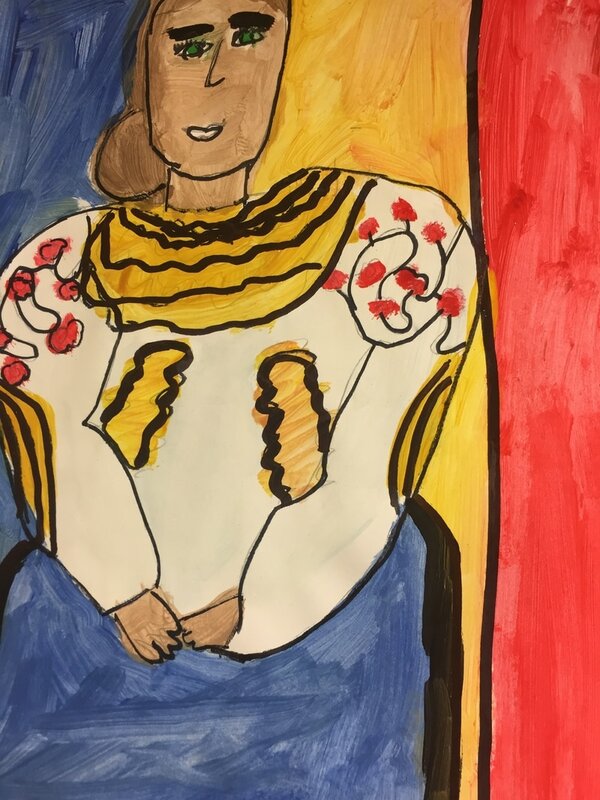 Henri Matisse’s friendship with Romanian painter Theodor Pallady sparked his interest in Romanian folk costume, a recurring theme in Matisse’s work. 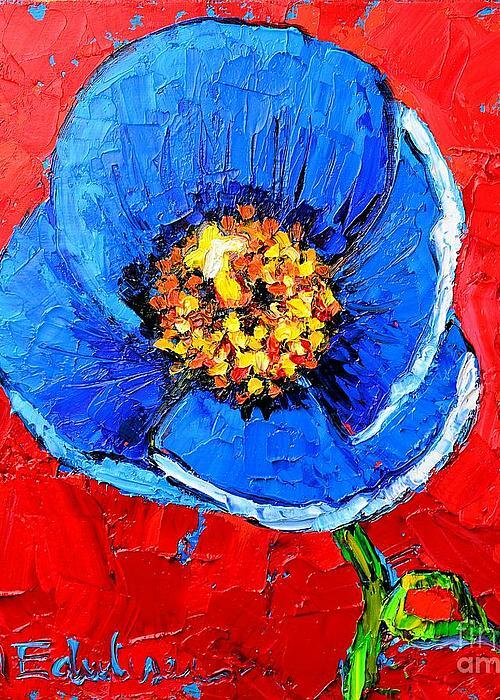 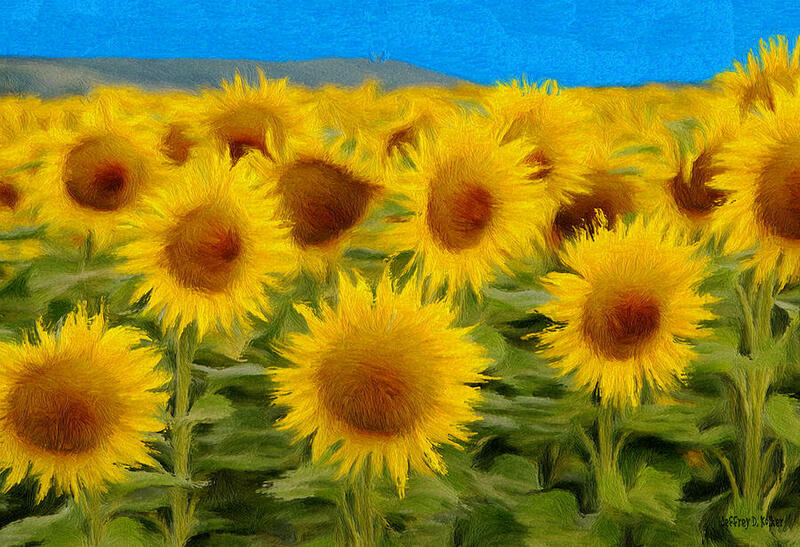 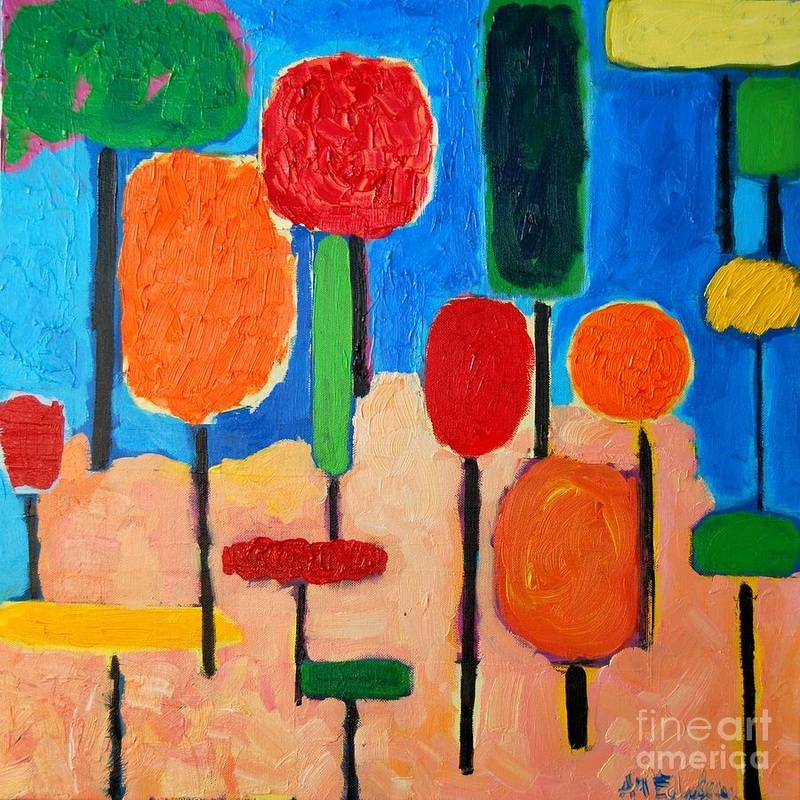 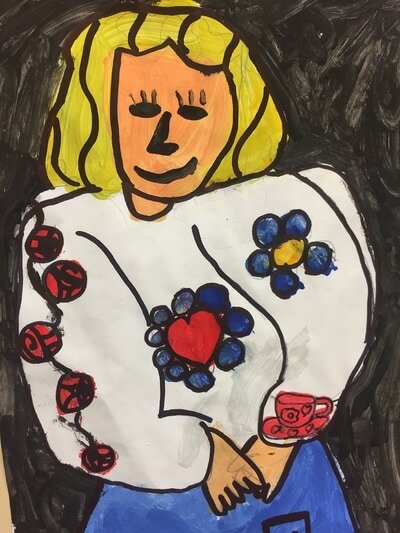 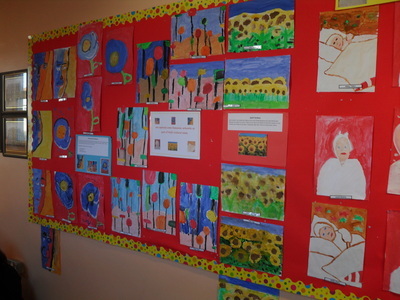 See a selection of our paintings below! 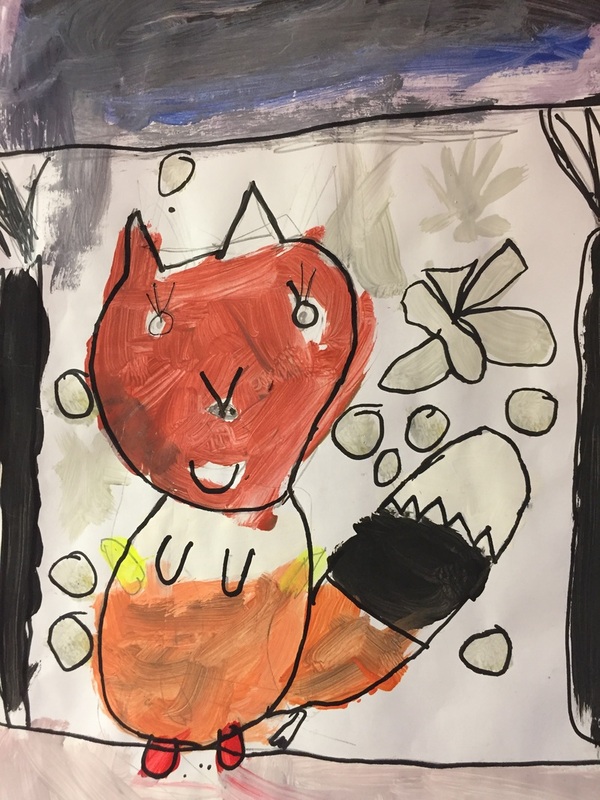 We have been learning all about badgers' and foxes' homes in SESE this week. 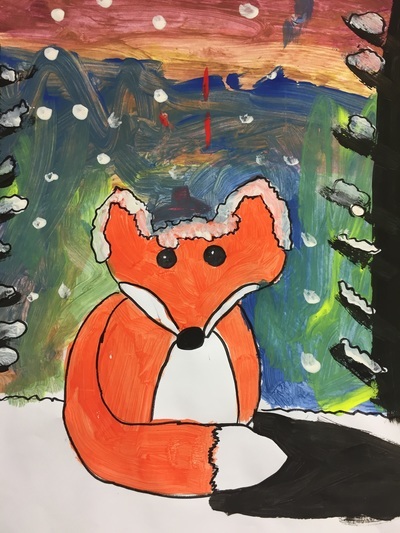 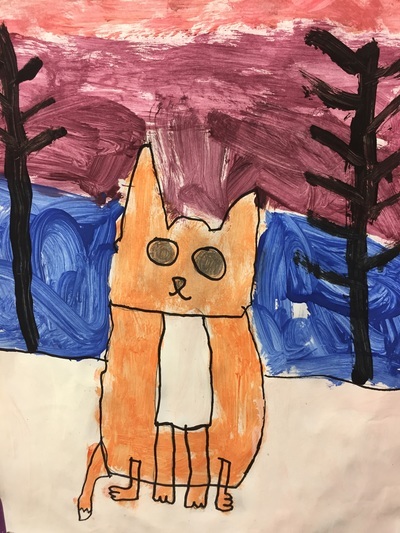 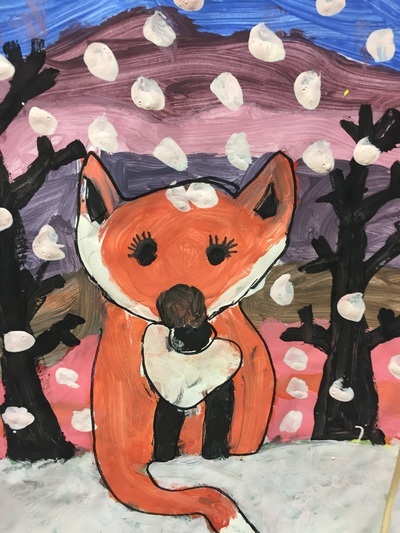 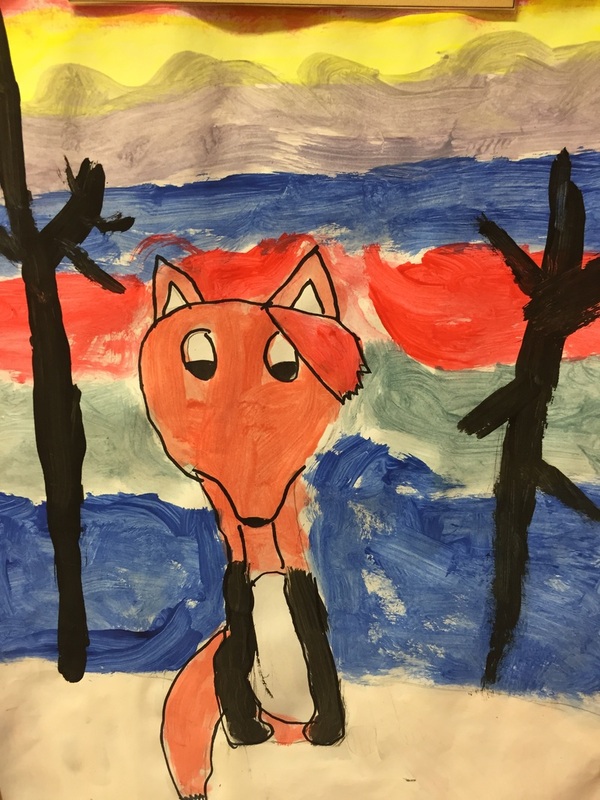 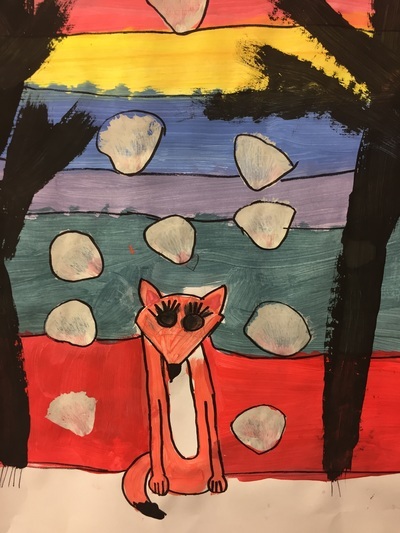 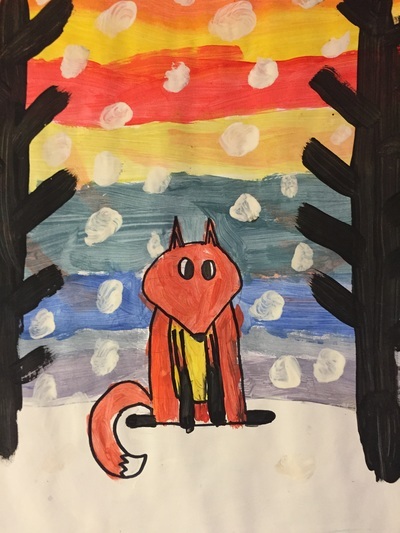 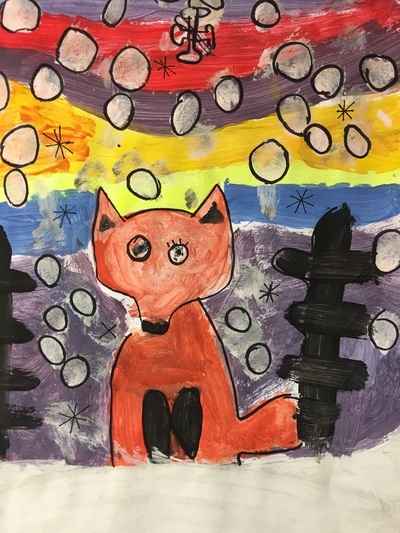 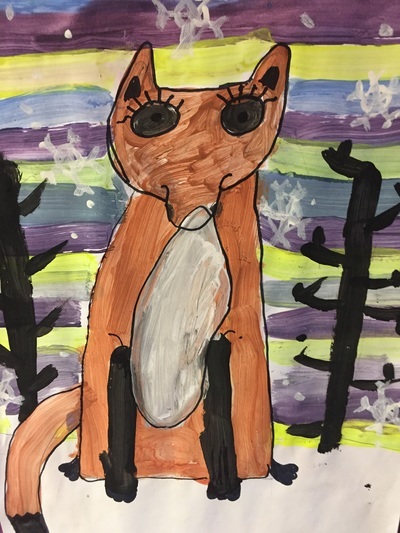 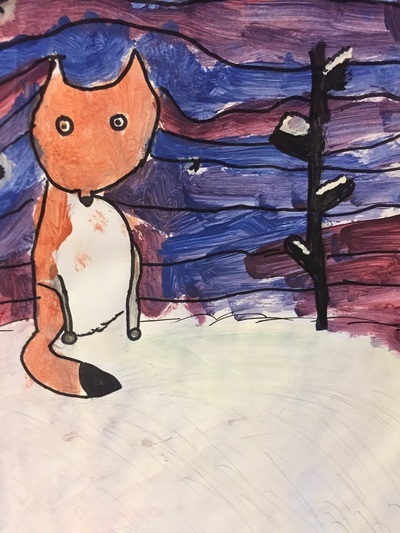 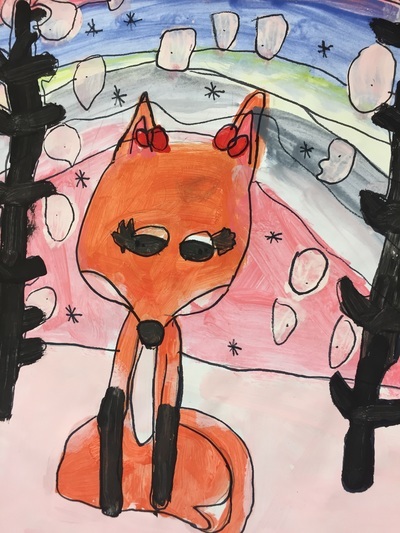 Check out our winter foxes below. 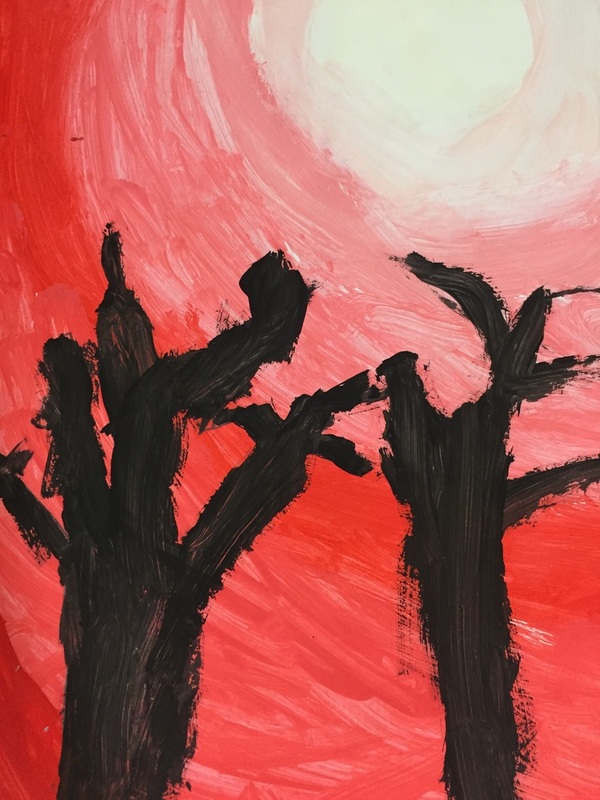 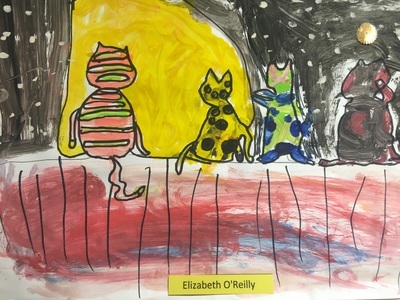 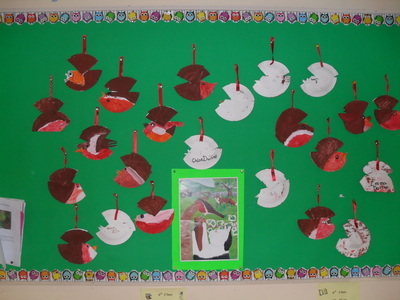 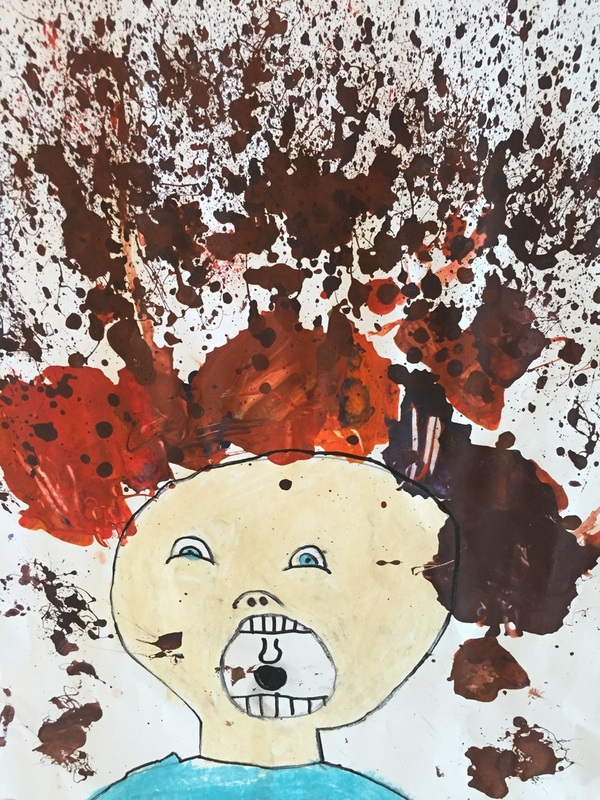 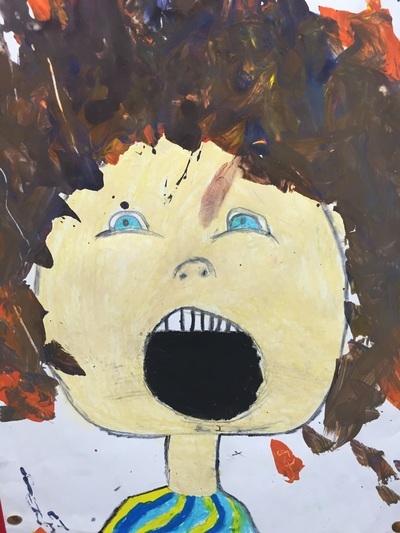 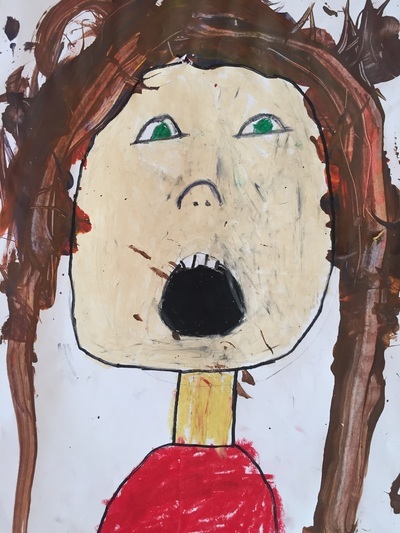 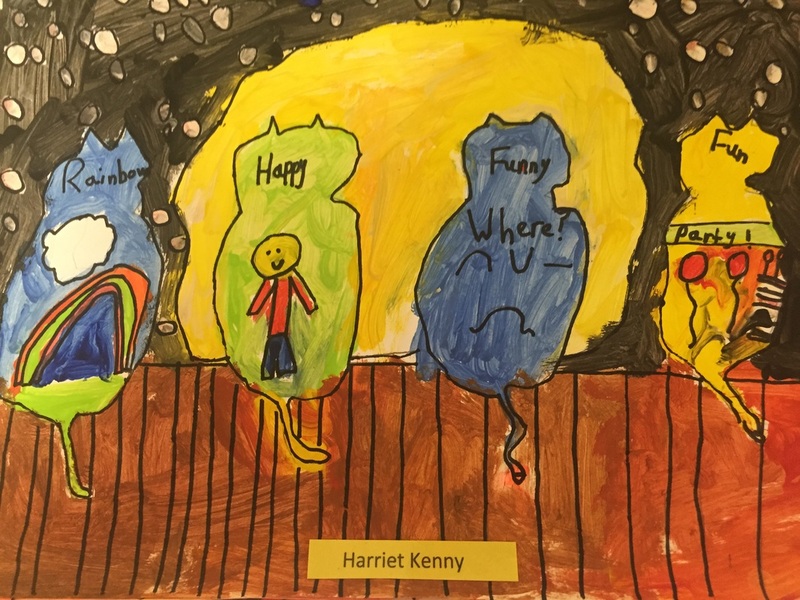 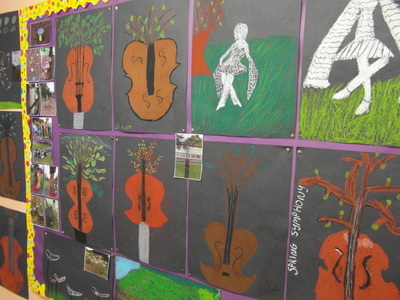 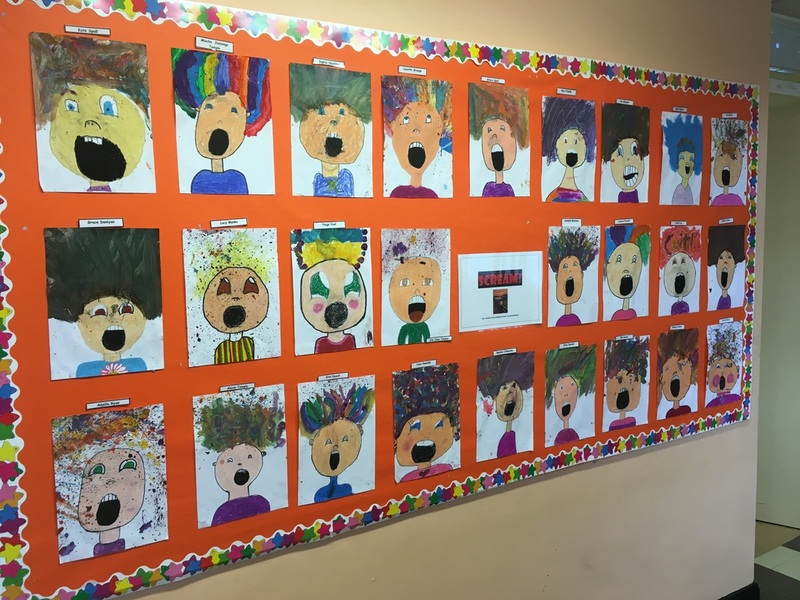 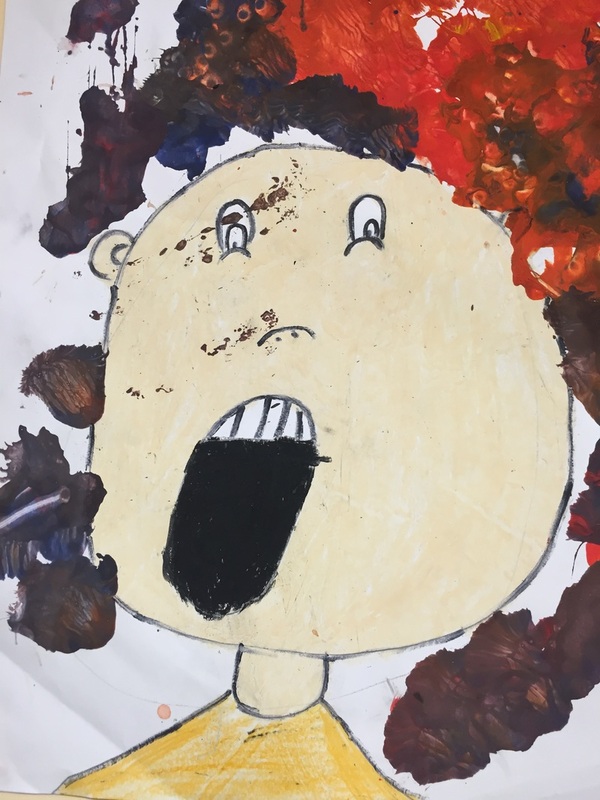 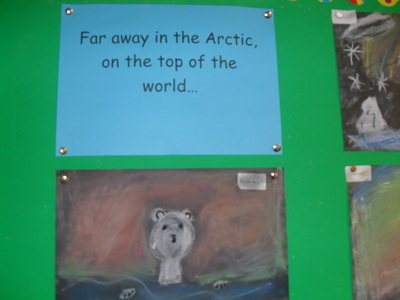 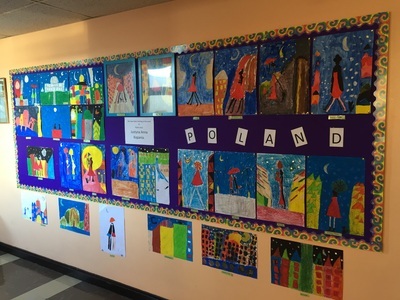 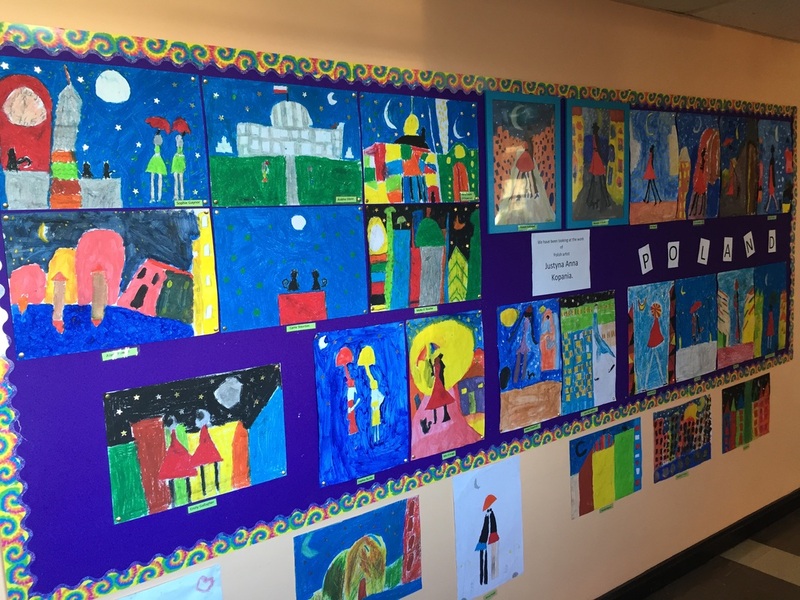 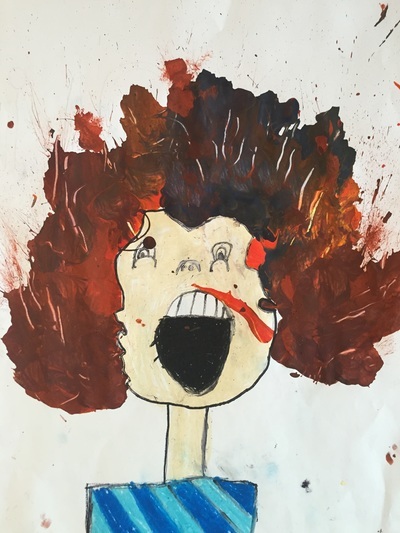 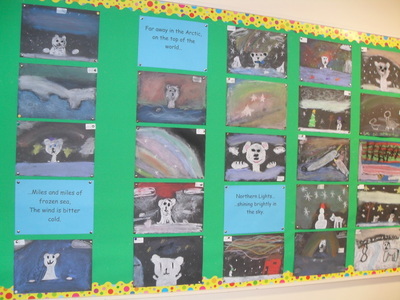 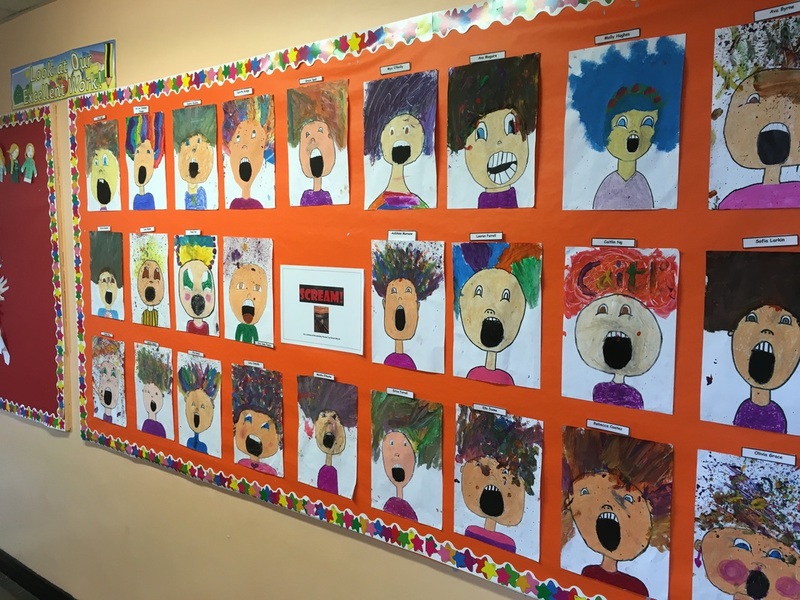 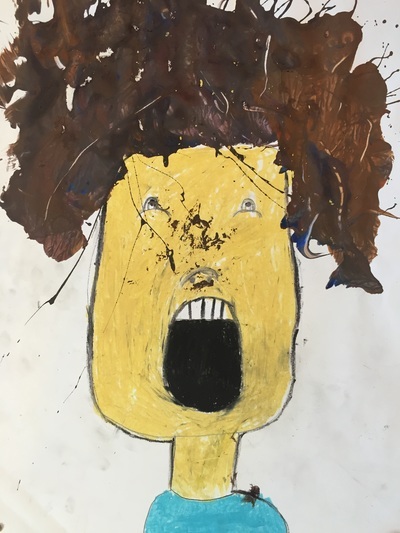 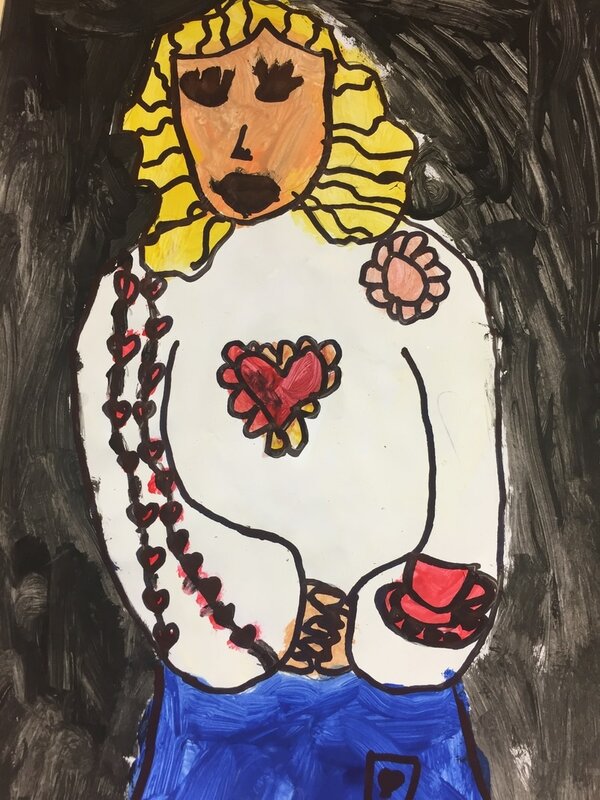 ''Scream' Paintings by Ms Devlin's 3rd Class (Based on painting by Edvard Munch). 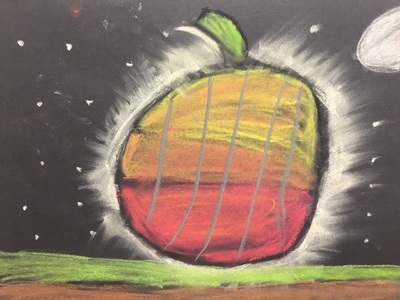 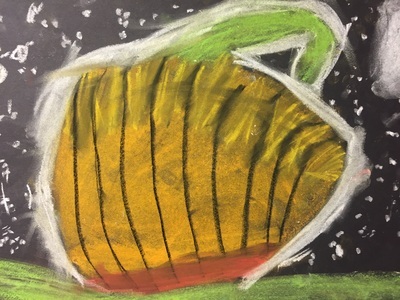 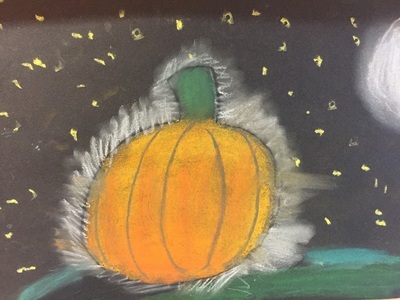 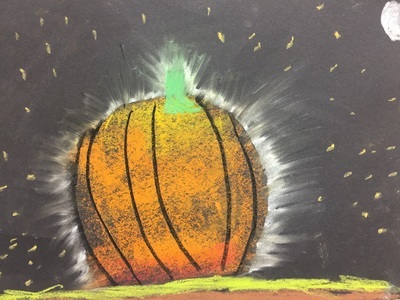 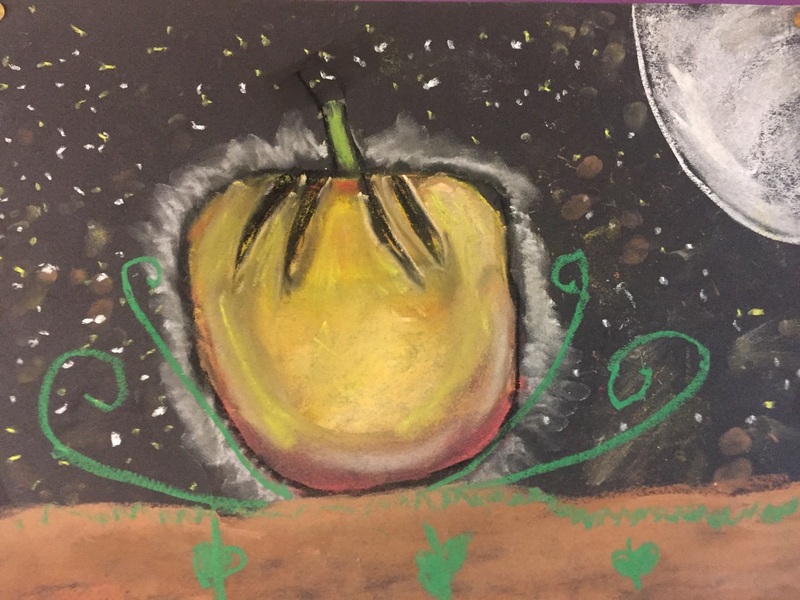 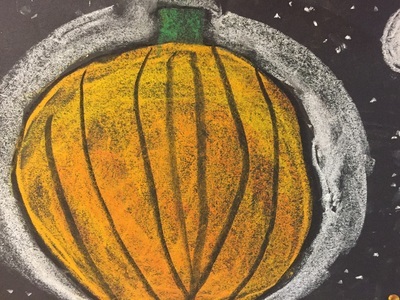 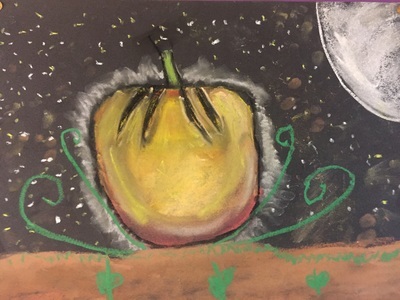 This was our first time using oil pastels! 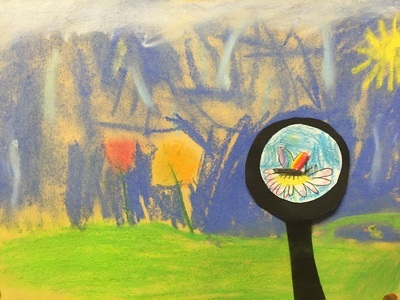 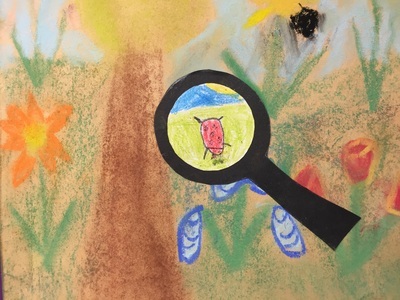 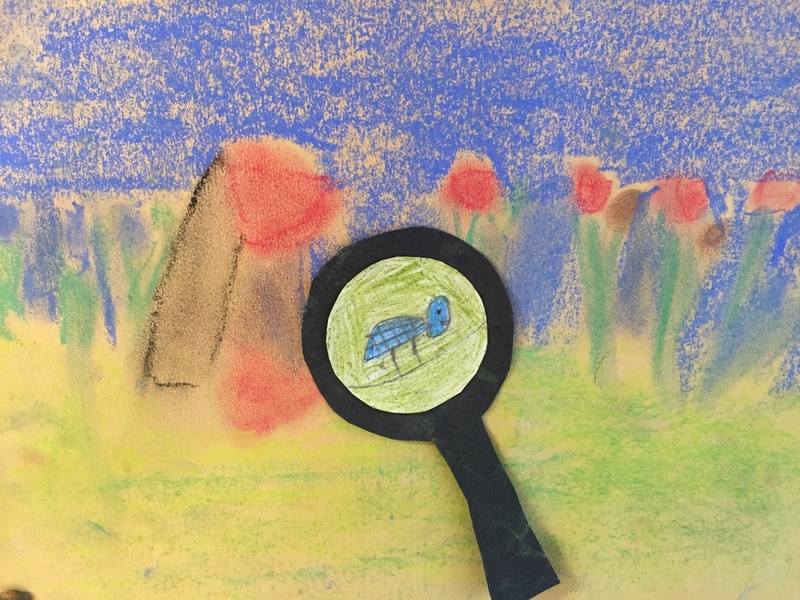 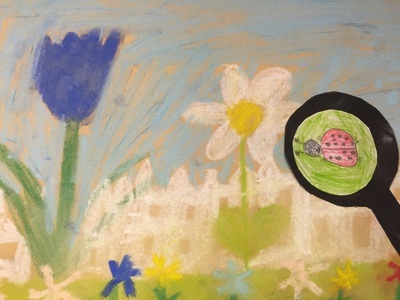 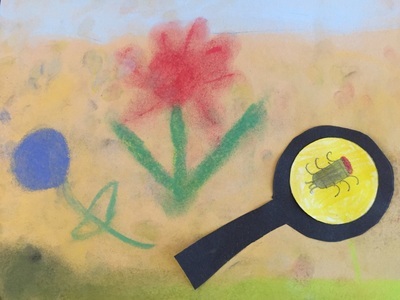 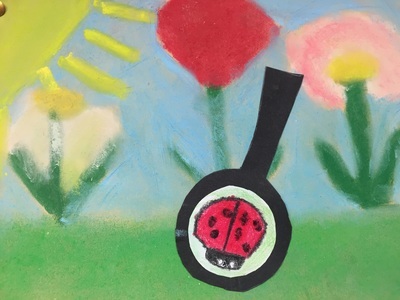 We each had to create a garden scene, before adding the magnifying glass with colourful minibeast to finish. 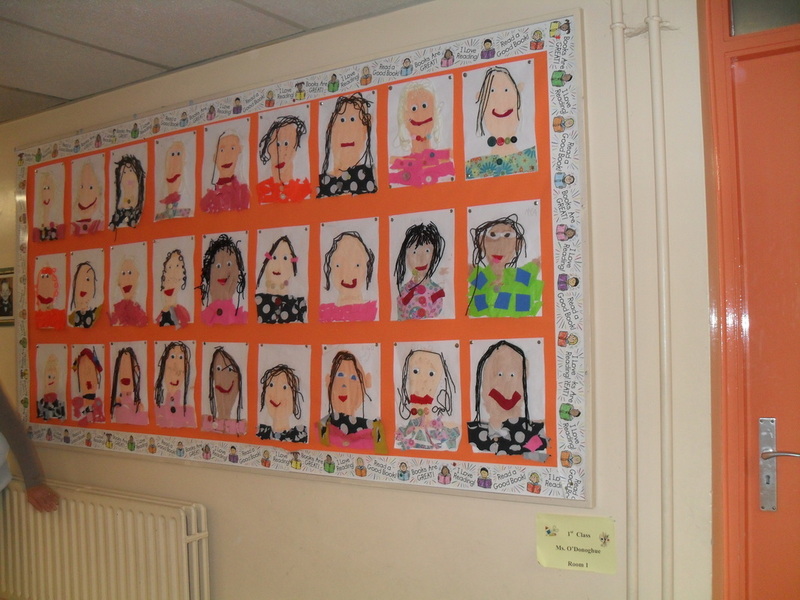 Don't they look lovely? 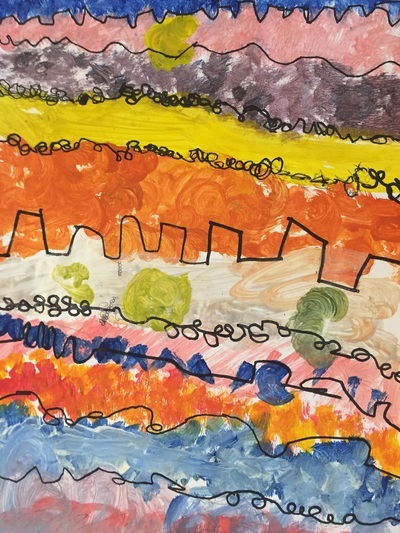 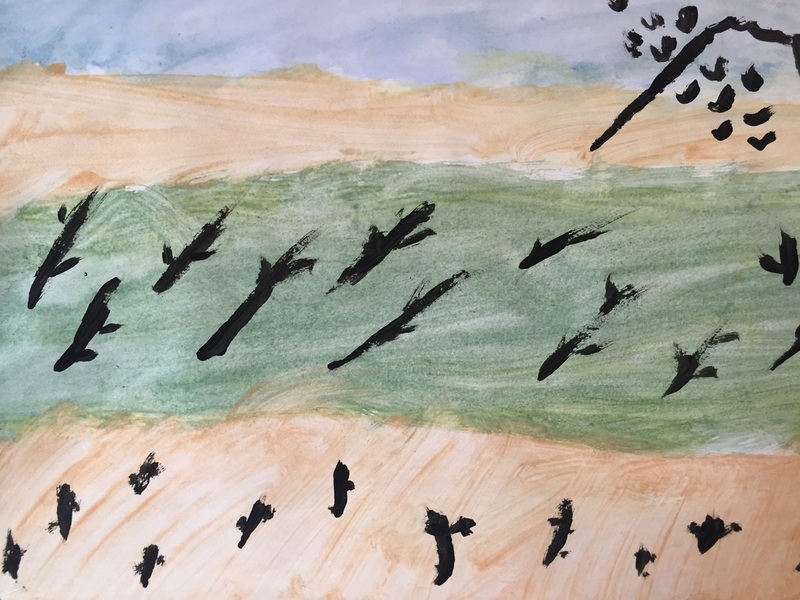 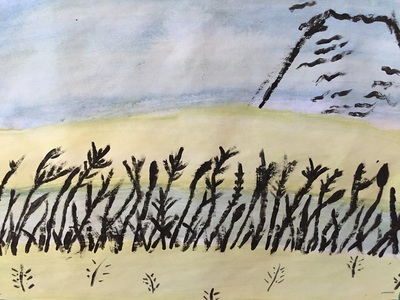 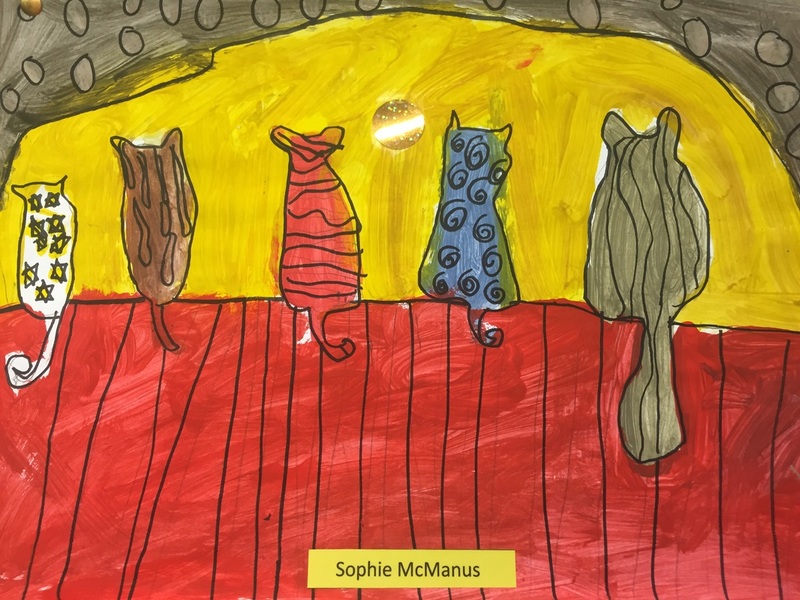 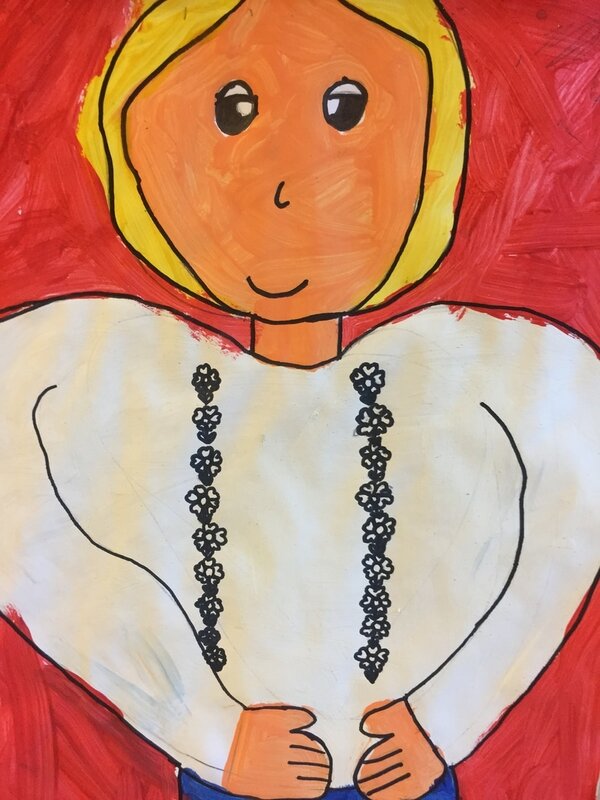 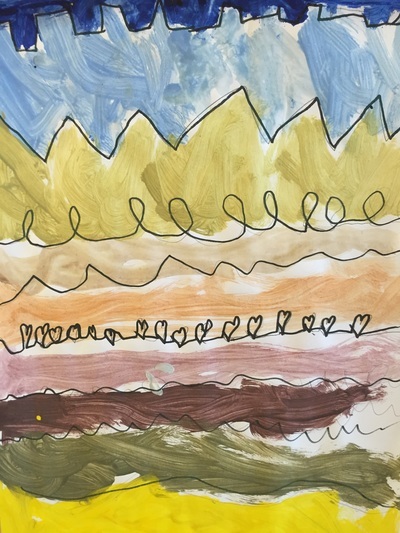 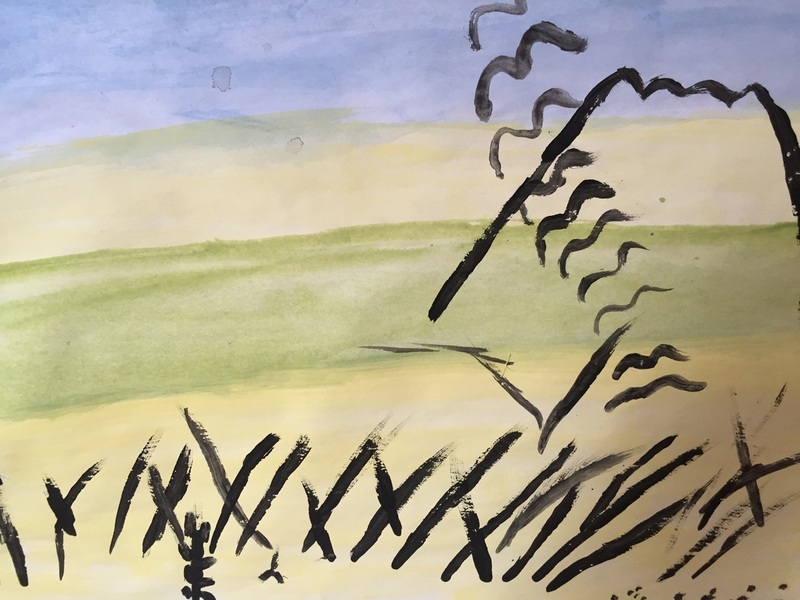 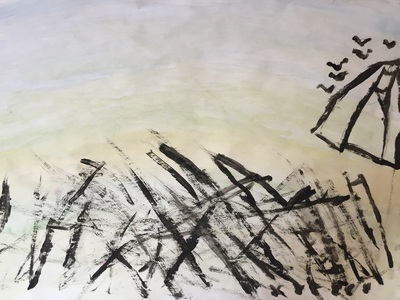 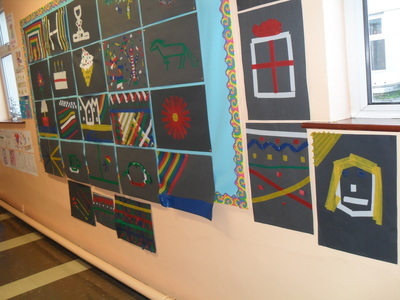 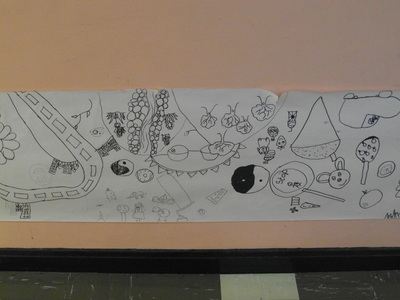 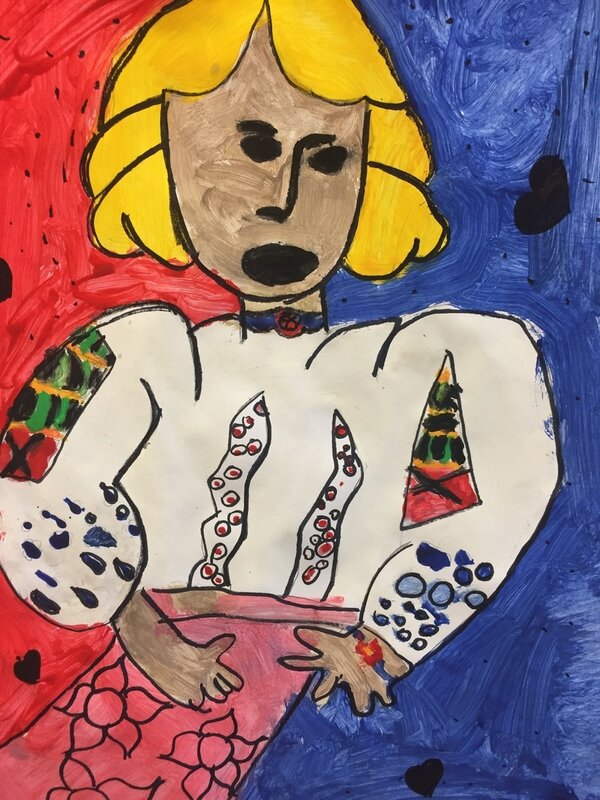 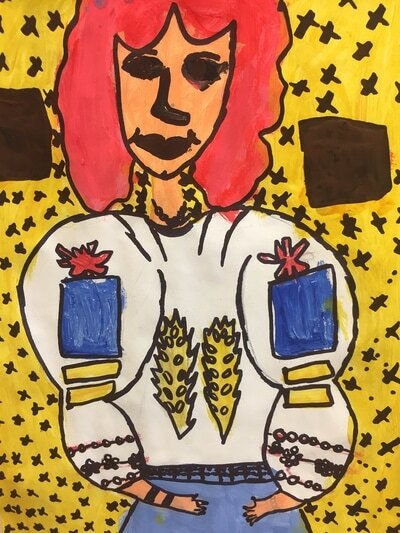 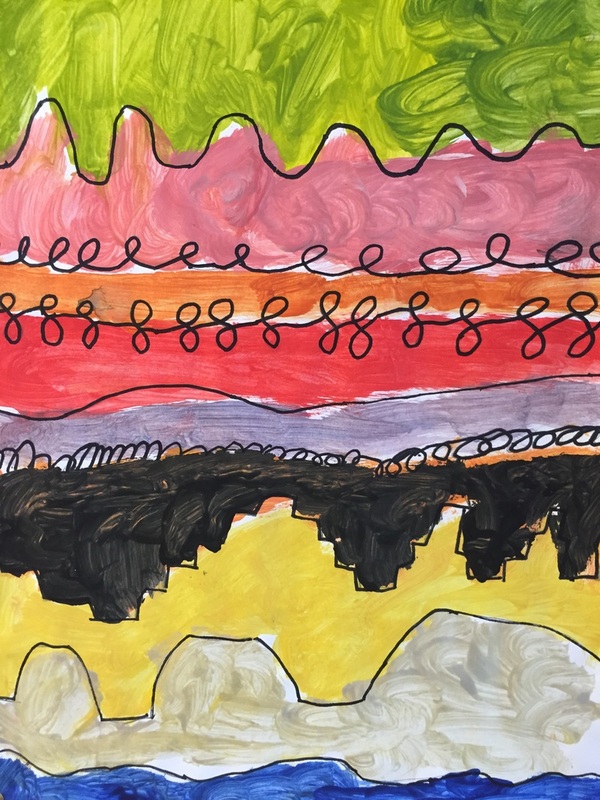 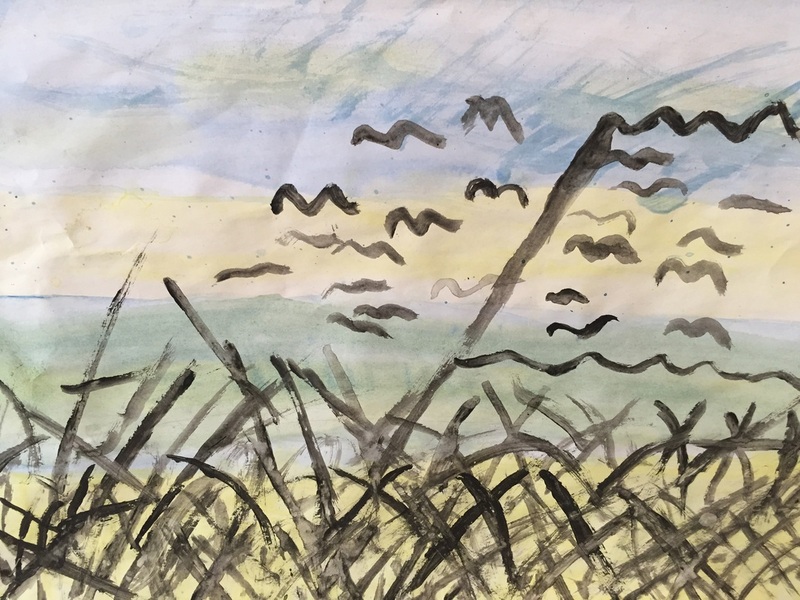 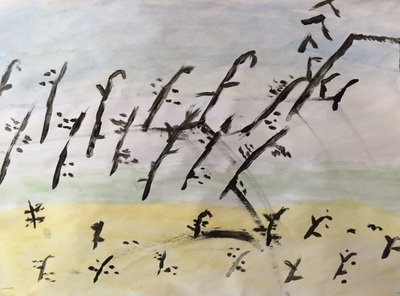 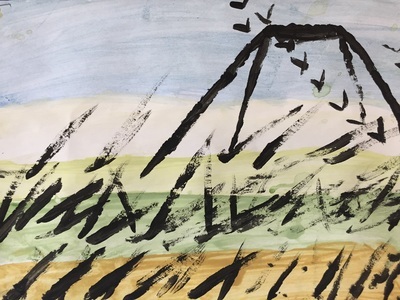 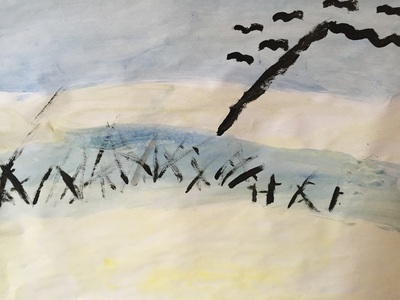 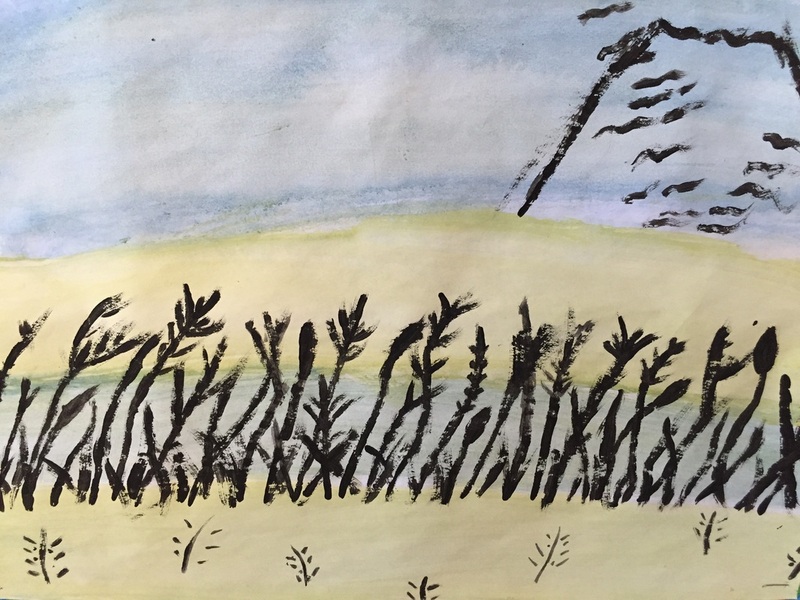 Having learned about the Normans and the Romans in school, we were intrigued by both the idea of scrolls and the Bayeux Tapestry, We wanted to tell the story of us and what was important to us on a continuous roll of paper as a drawing project in school. 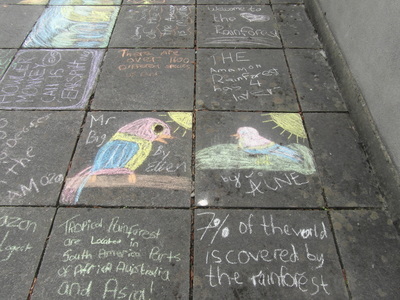 Who knows- it might be used as evidence by archaeologists of the future! 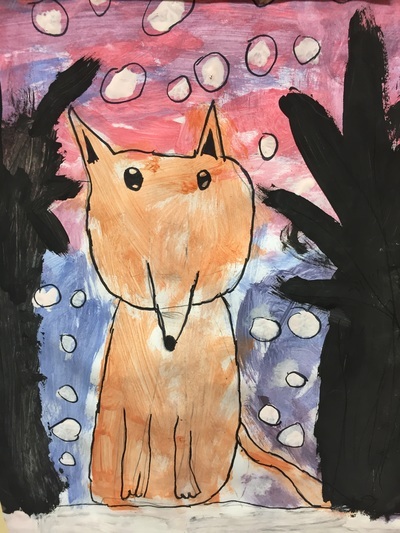 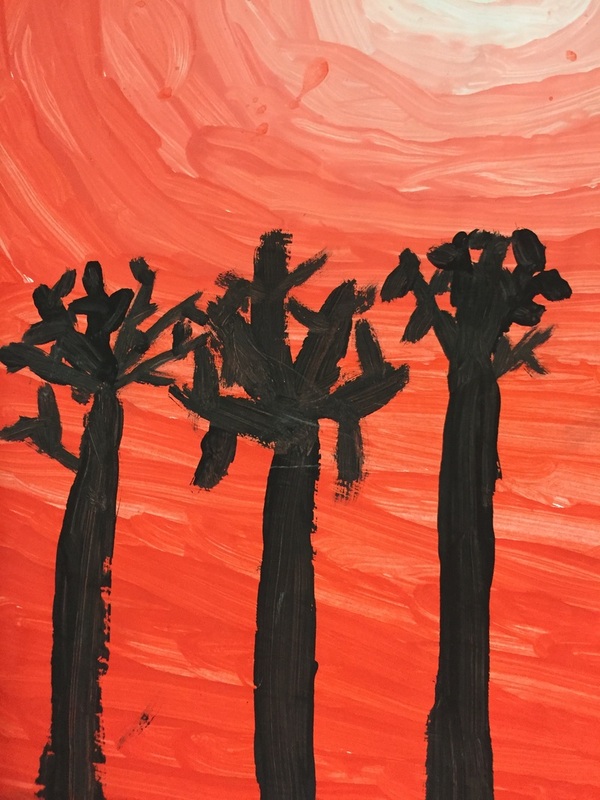 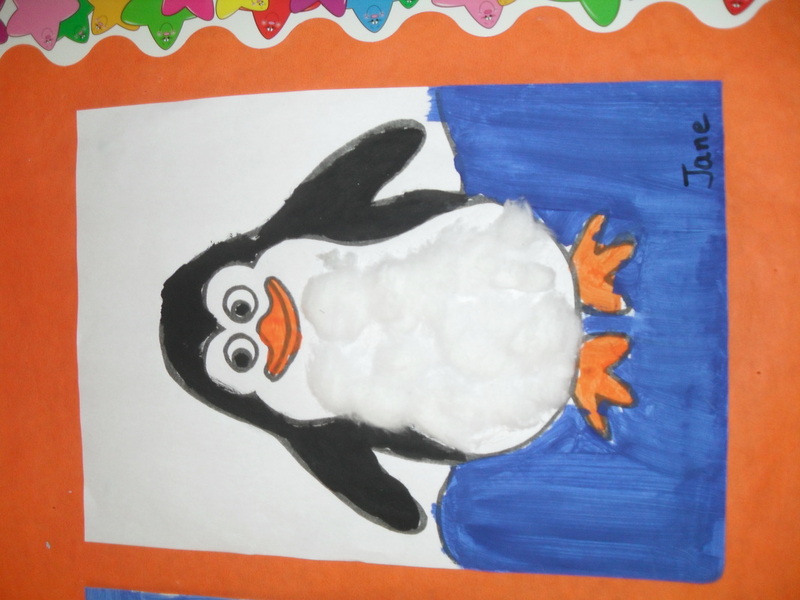 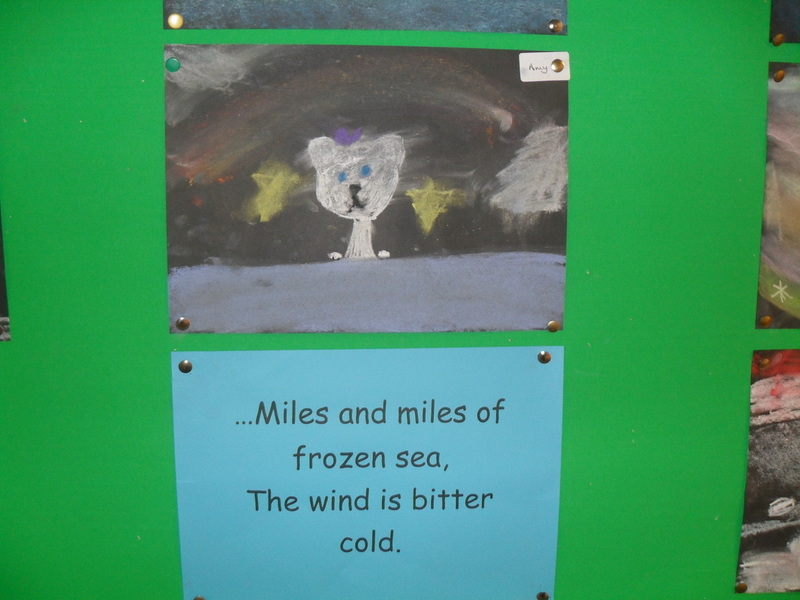 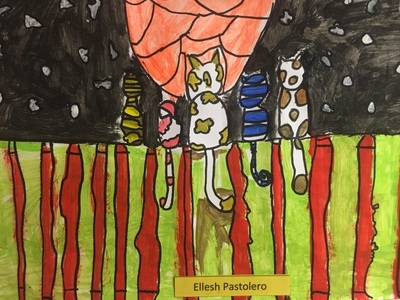 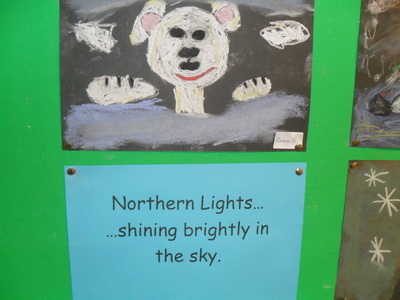 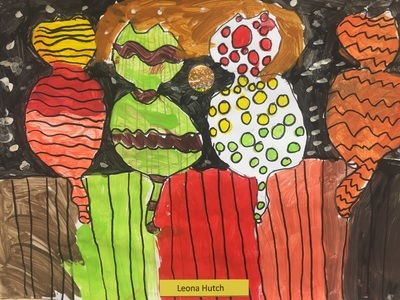 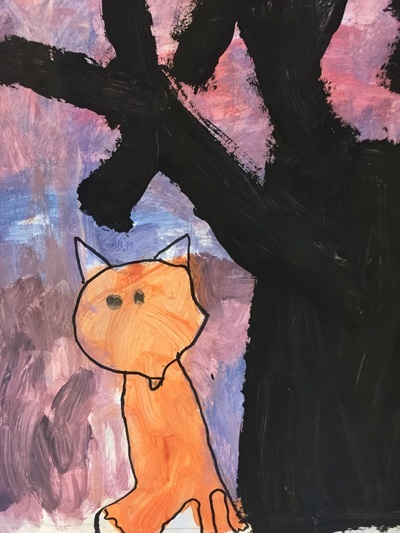 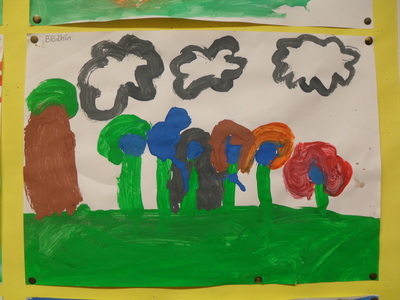 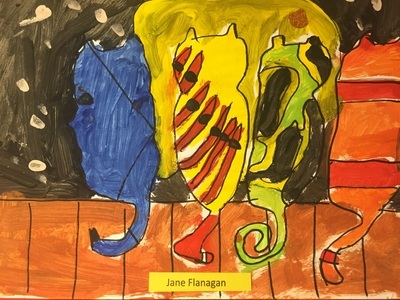 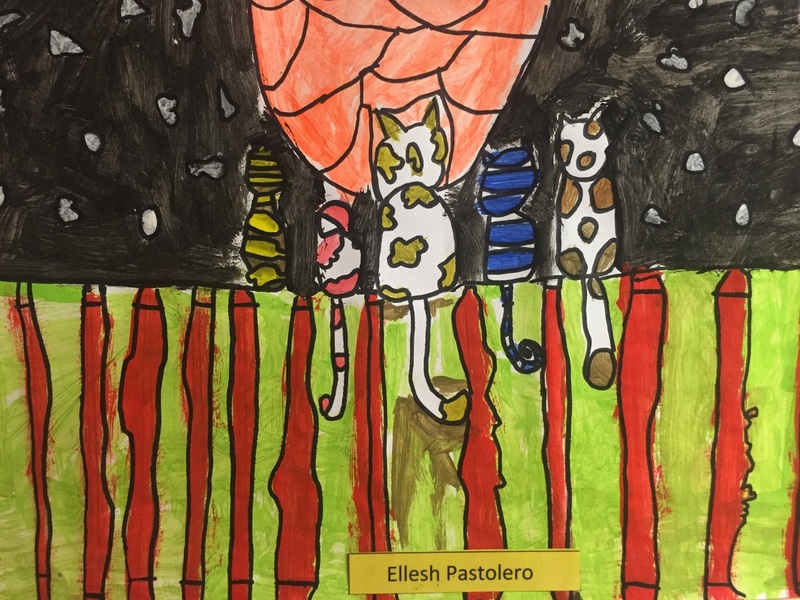 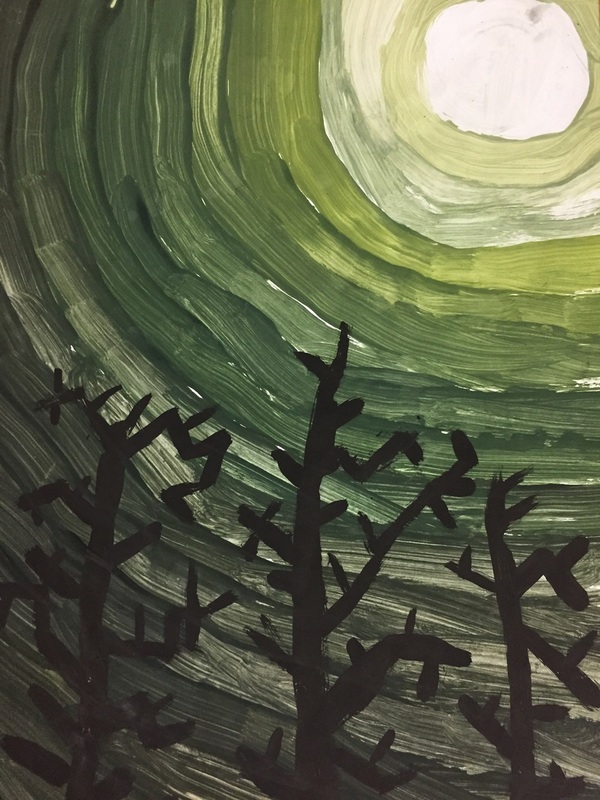 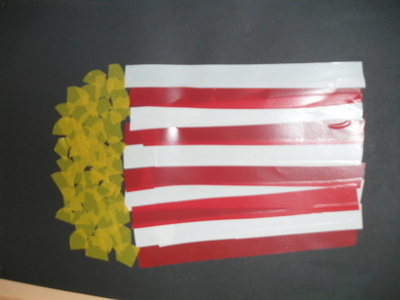 See our wonderful Tints and Shades paintings below. 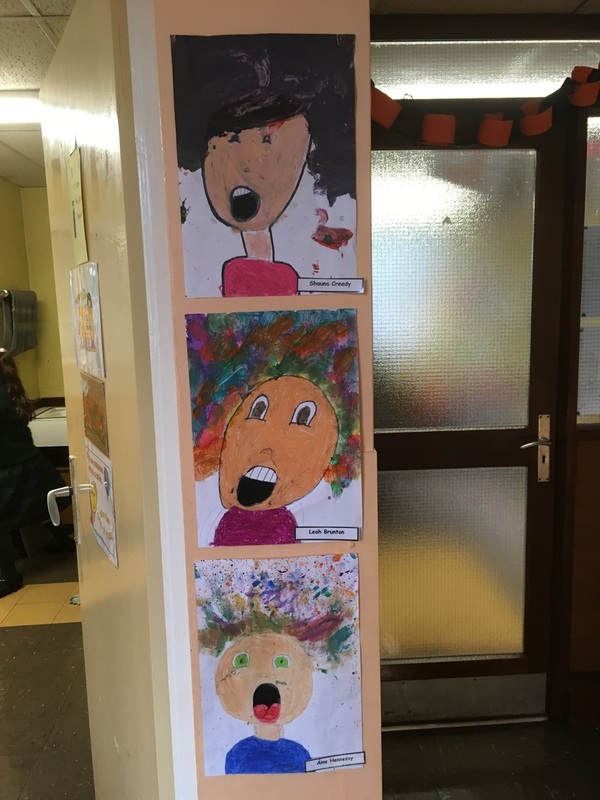 We each started off in the top right hand corner with some pure white paint, before adding a small amount of colour each time to achieve the look. 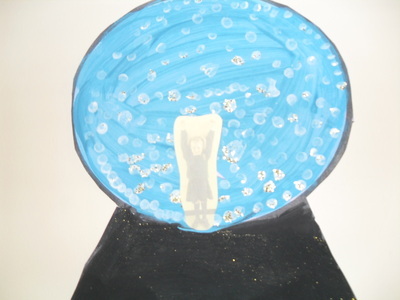 A drop of black was added at the very end to darken down the original colour. 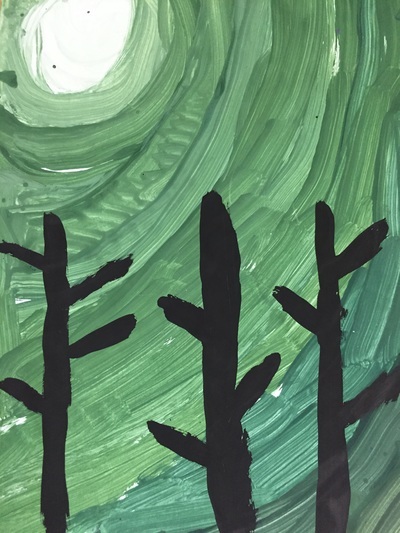 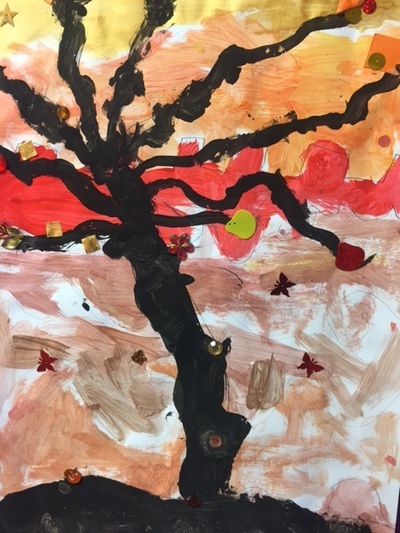 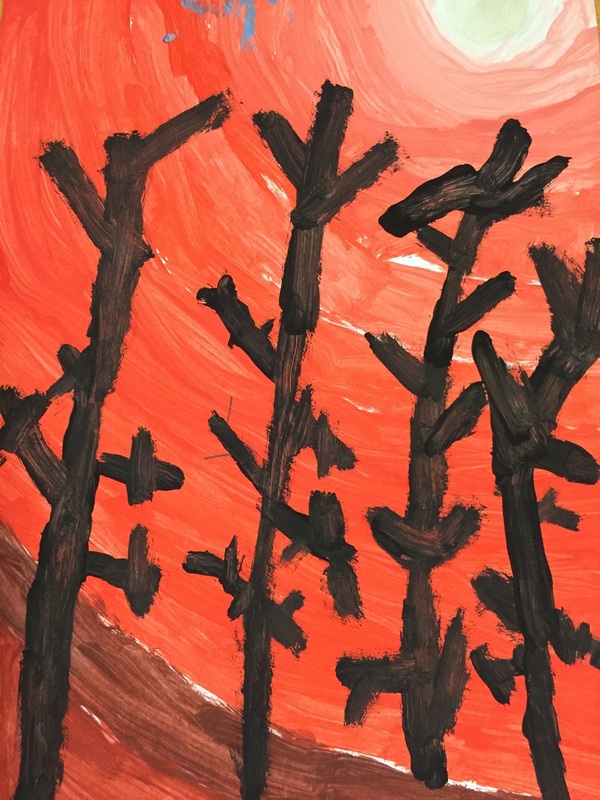 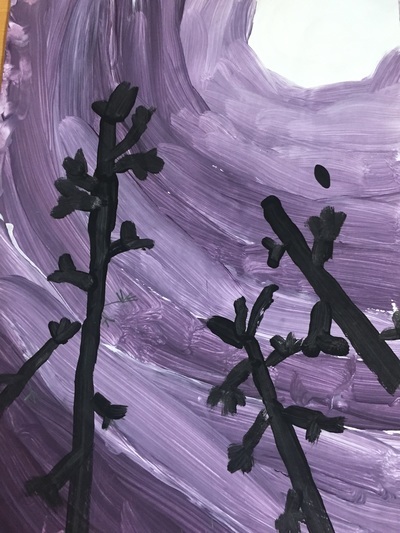 We finished off our pieces with some cool winter trees. 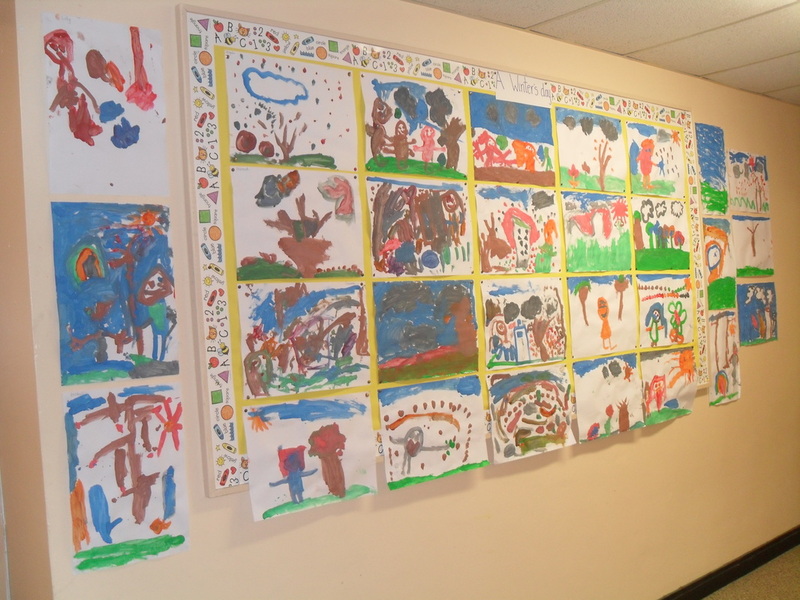 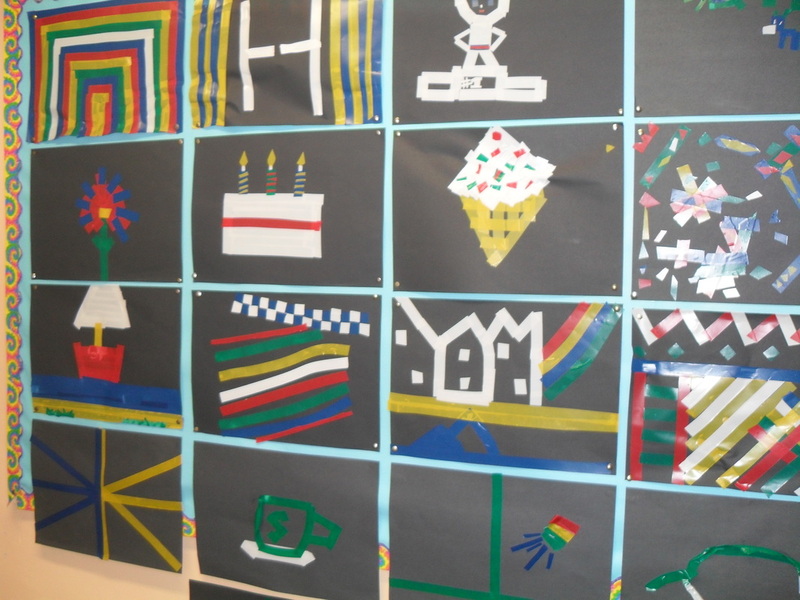 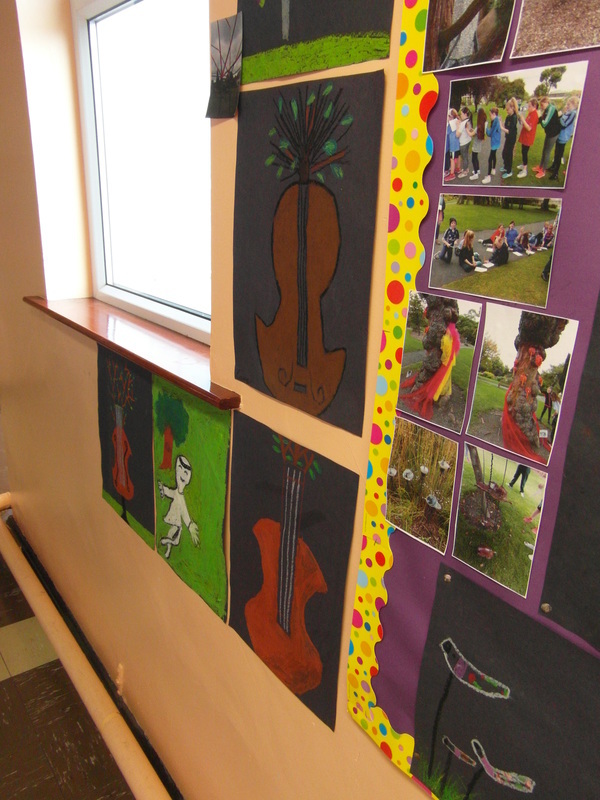 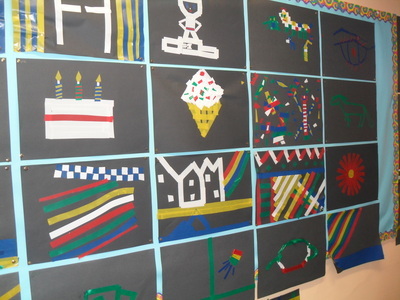 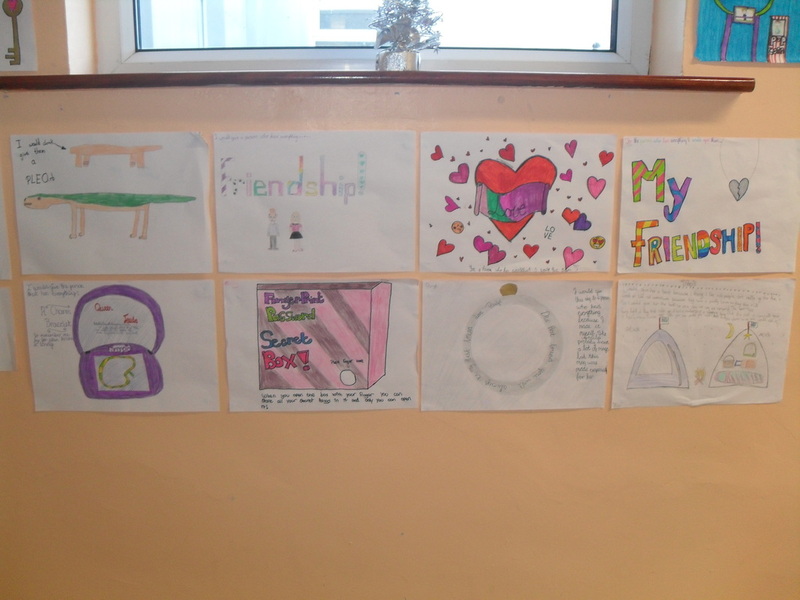 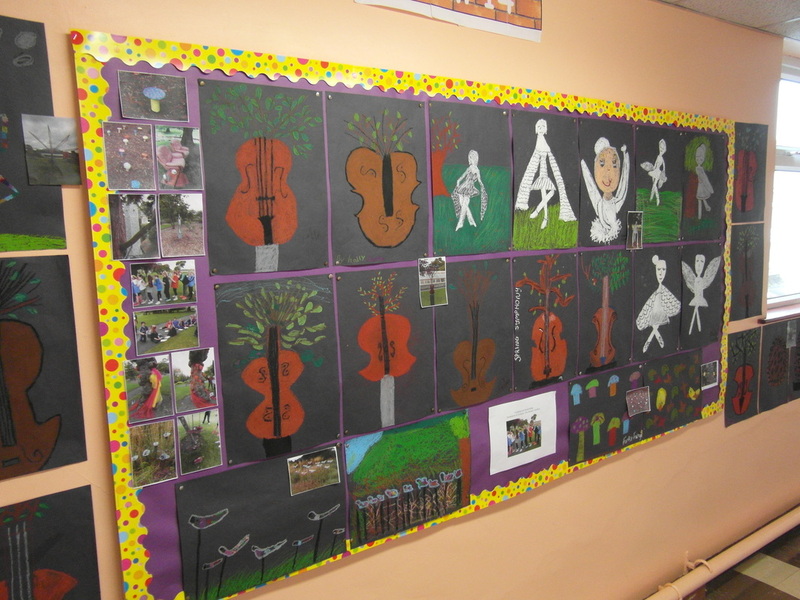 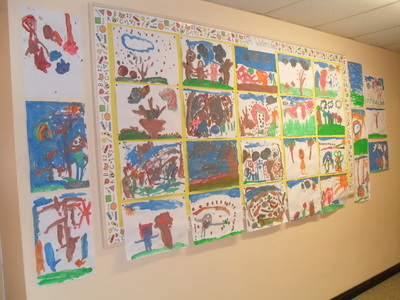 Our colourful paintings mark the start of Litriú for us in Room 9. 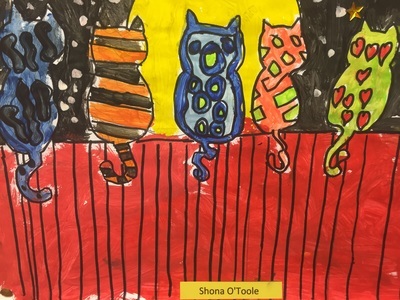 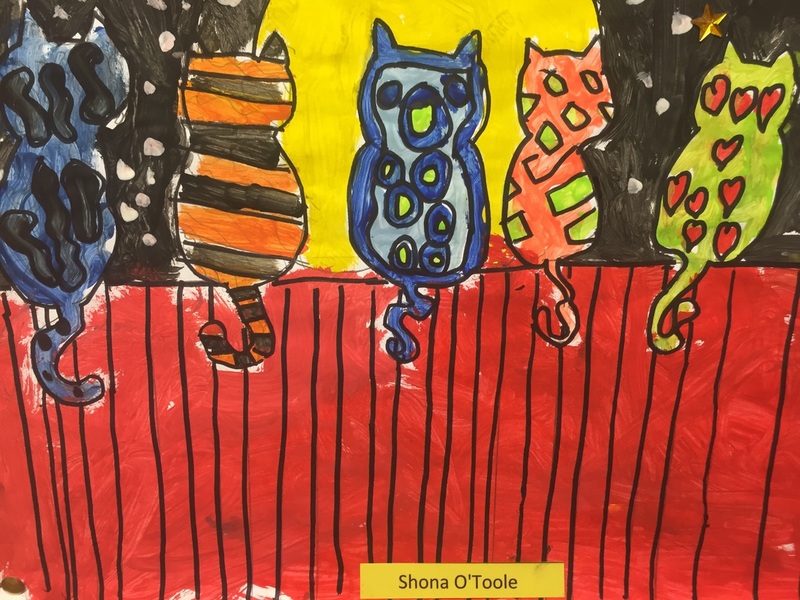 Our very first Irish spelling was 'cat', followed by other 'a' words such as madra, hata and glas. 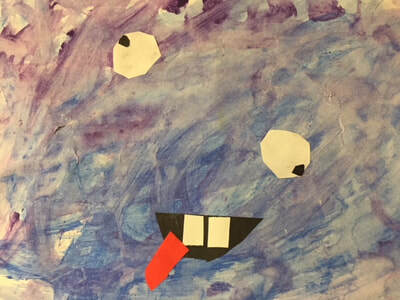 We drew inspiration from the work of Nick Gustafson. 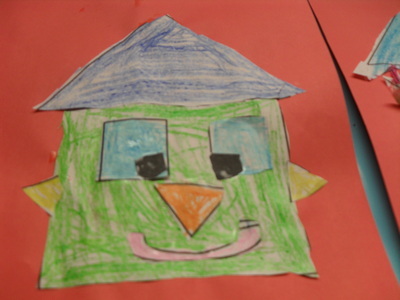 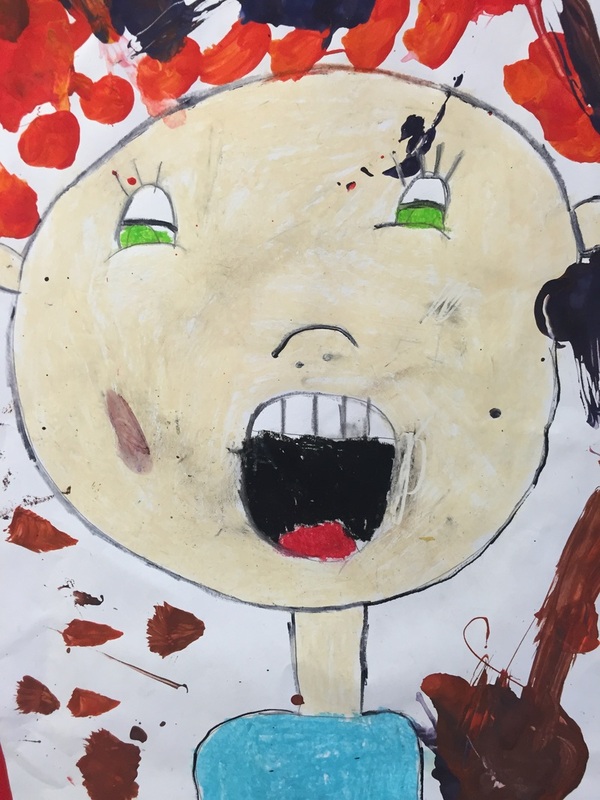 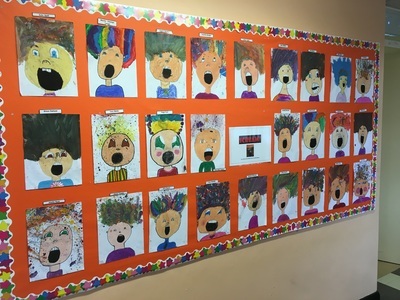 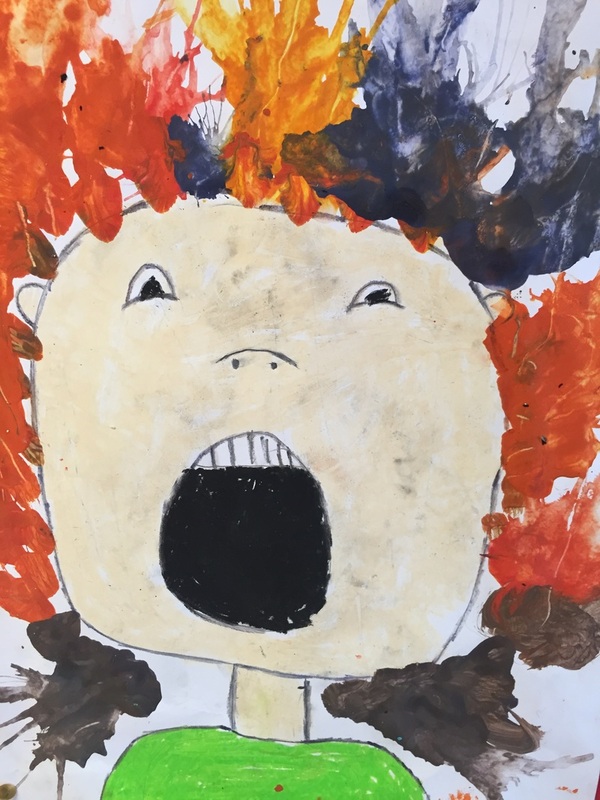 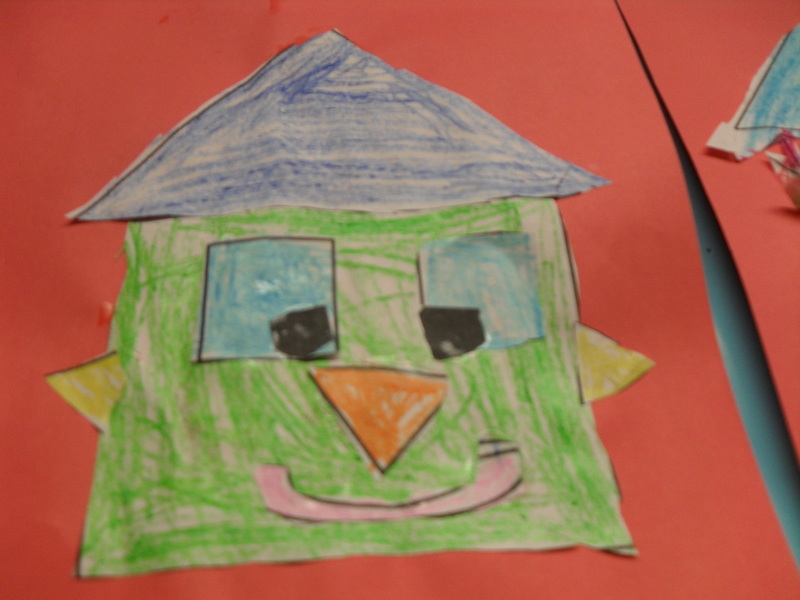 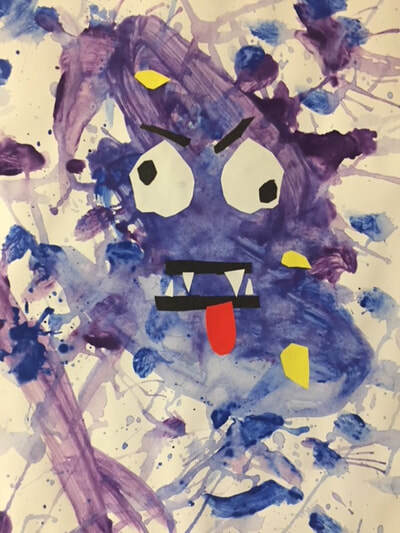 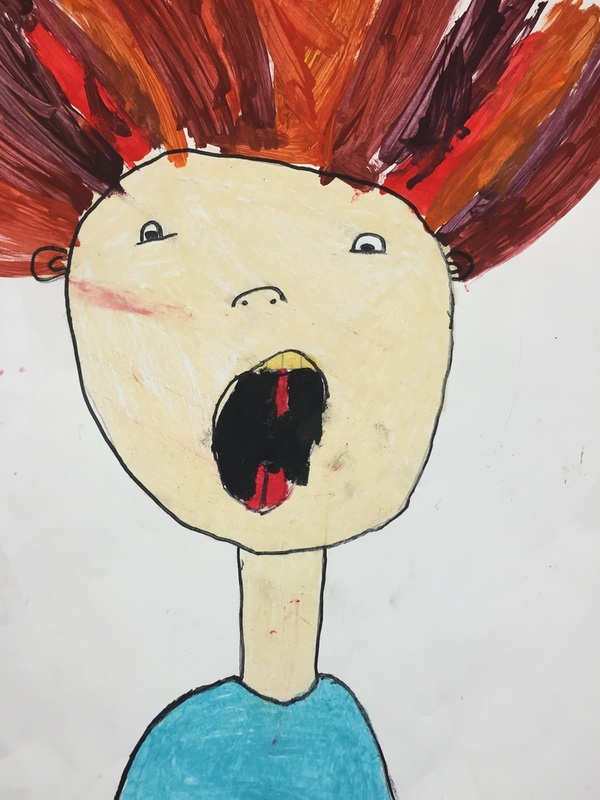 We used oil pastels and paints to create these screaming faces. 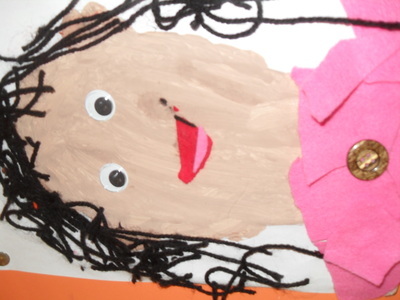 The rather scary looking hair was made possible with the help of some clever blow painting. 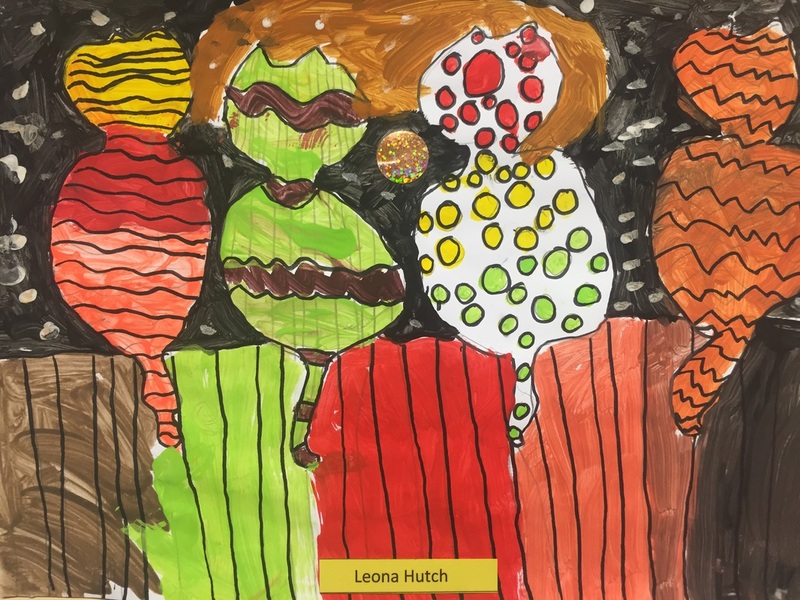 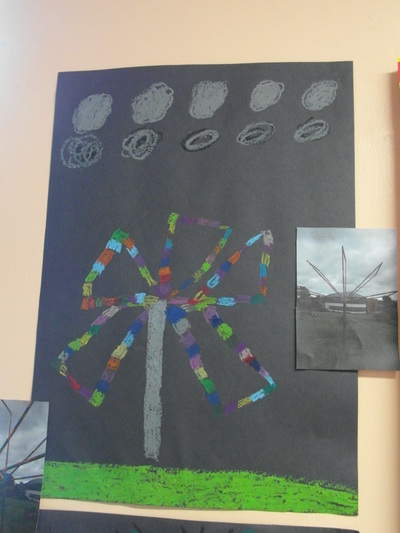 Following our visit to the Sculptures in Context Exhibition in the Botanic Gardens, we drew elements of our favourites using oil pastels. 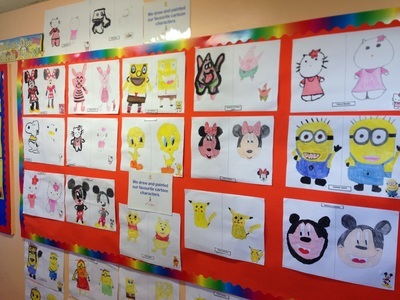 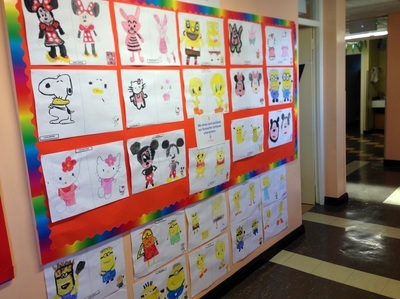 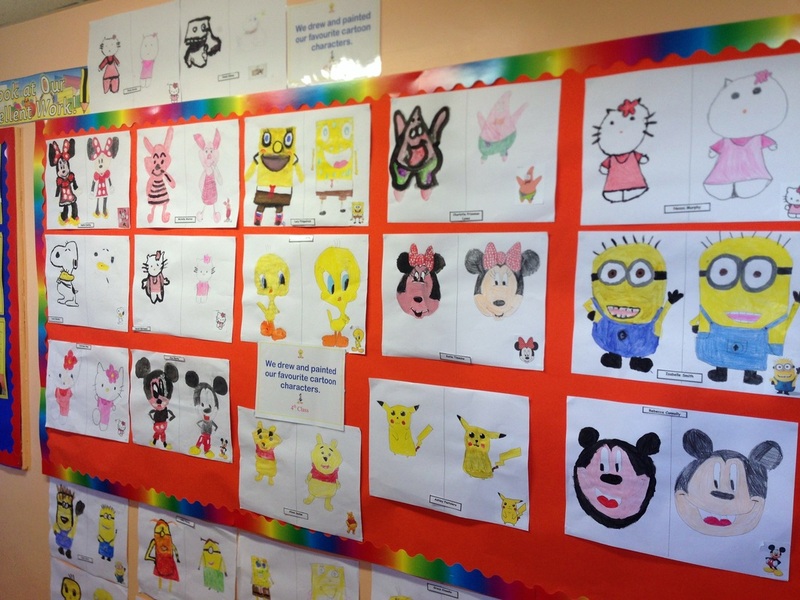 We drew and painted our favourite cartoon characters in September. 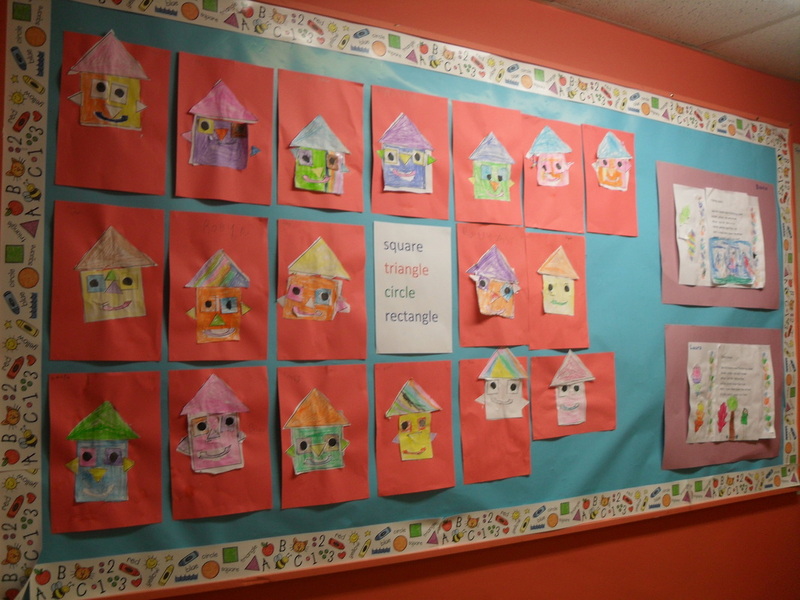 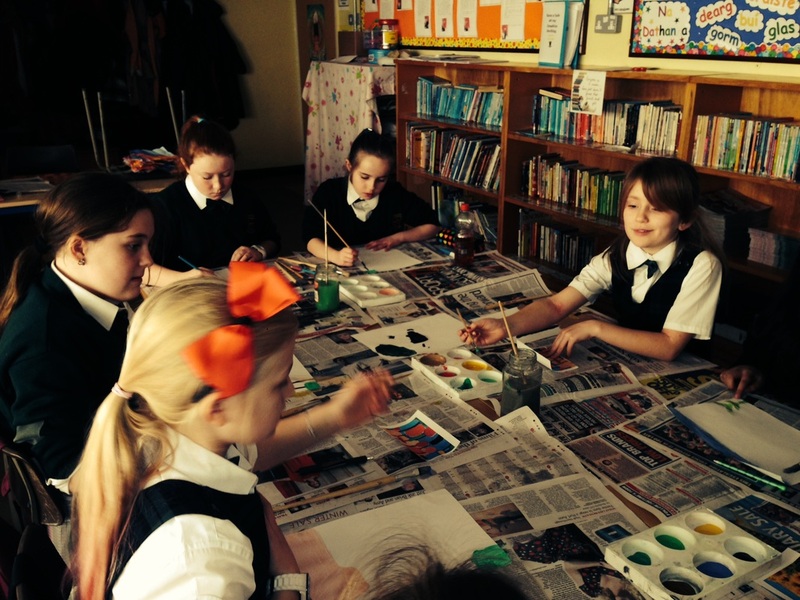 We worked really hard on them and enjoyed the lessons. 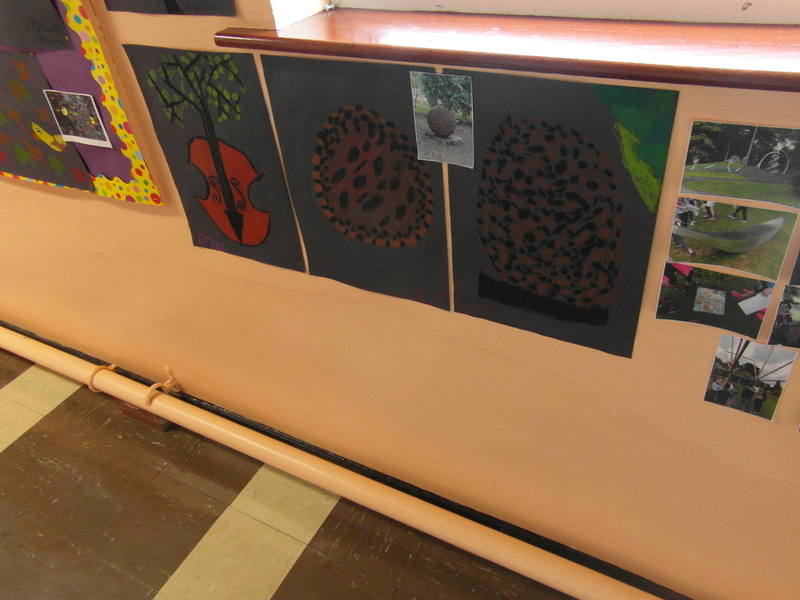 We learned all about the rainforest of Ecuador in class and decided to use our creativity to display our new-found facts! 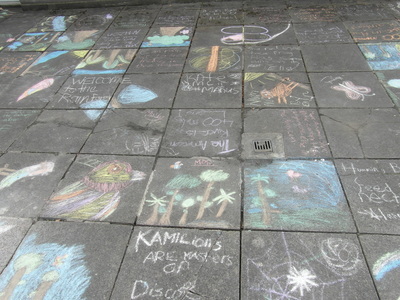 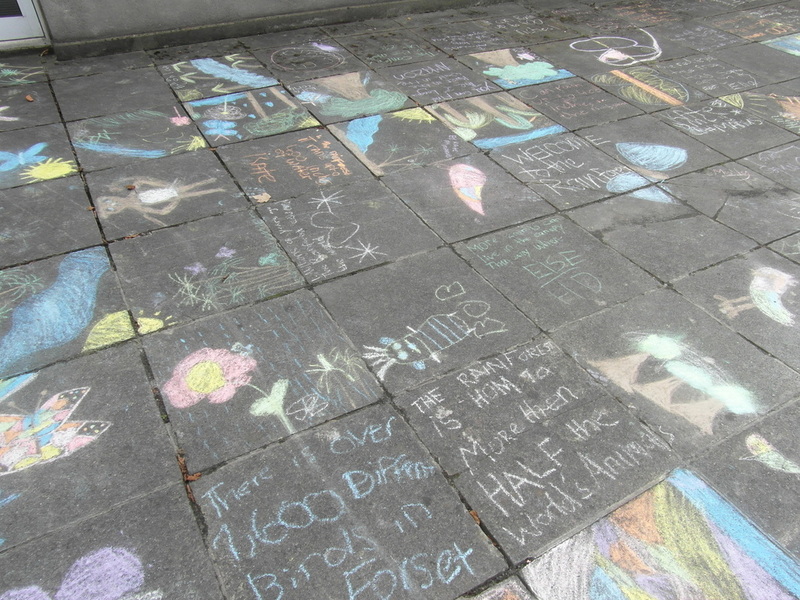 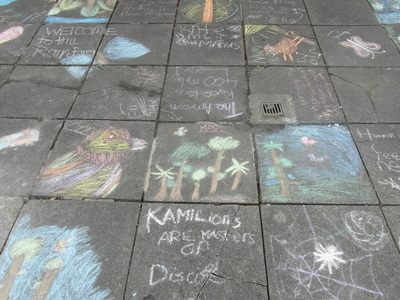 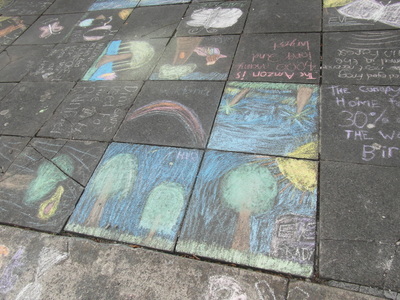 Because we used chalk, it was only a temporary exhibition but it certainly brightened up the concrete while it was there! Ando (or Utagawa) Hiroshige worked in the ukiyo-e style, documenting everyday life in Japan. He reduced scenes to ornamental groupings of simplified lines and shapes, which were considered calming to look at. 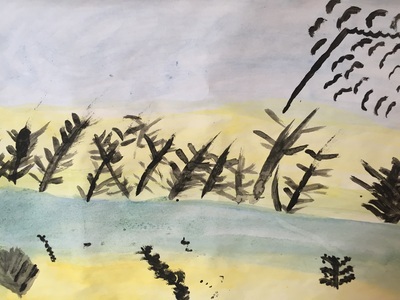 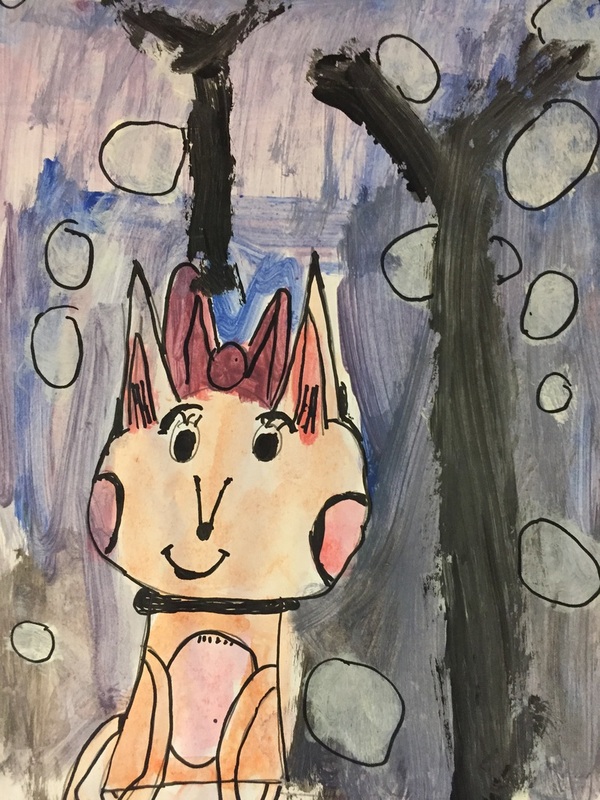 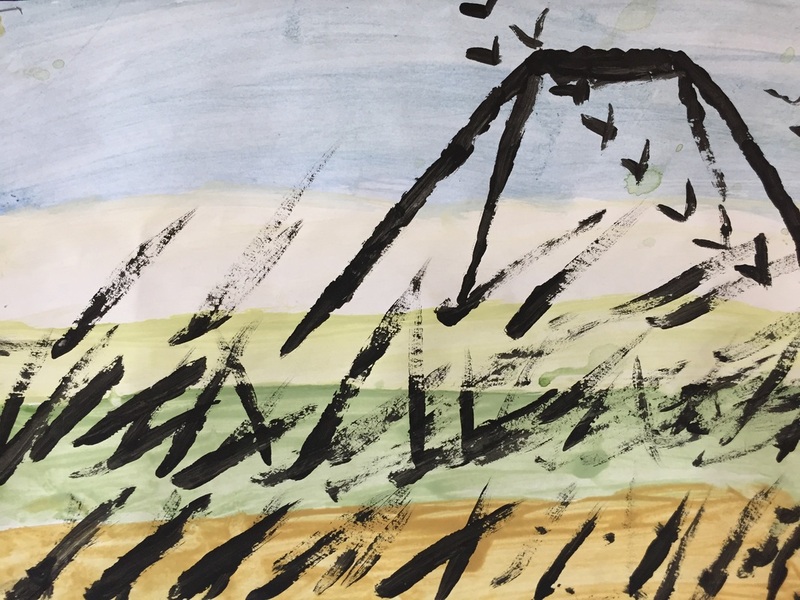 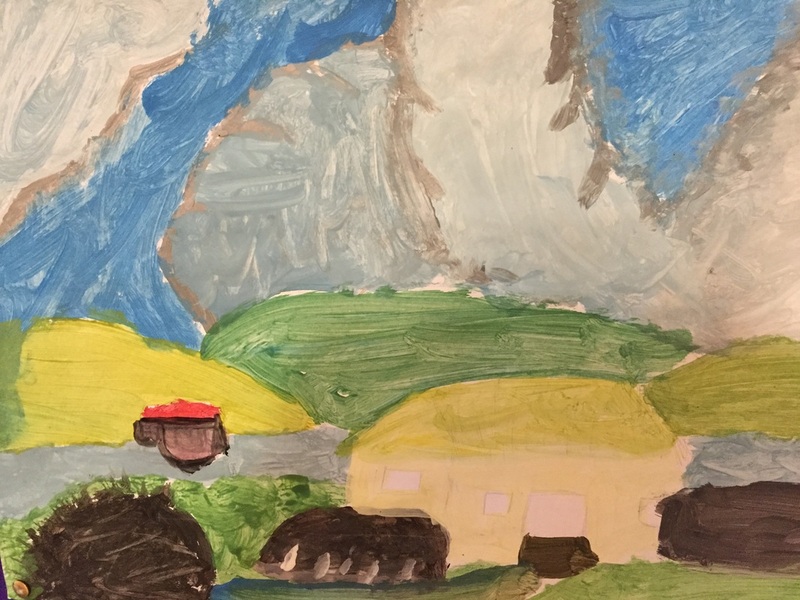 We looked at one of his paintings as part of our work on Japan. 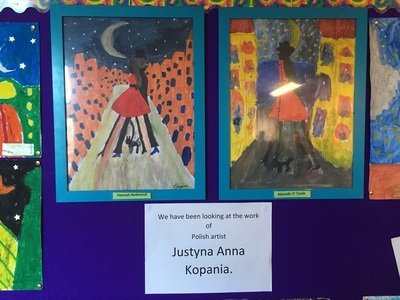 We took a look at the work of Polish artist Justyna Anna Kopania. 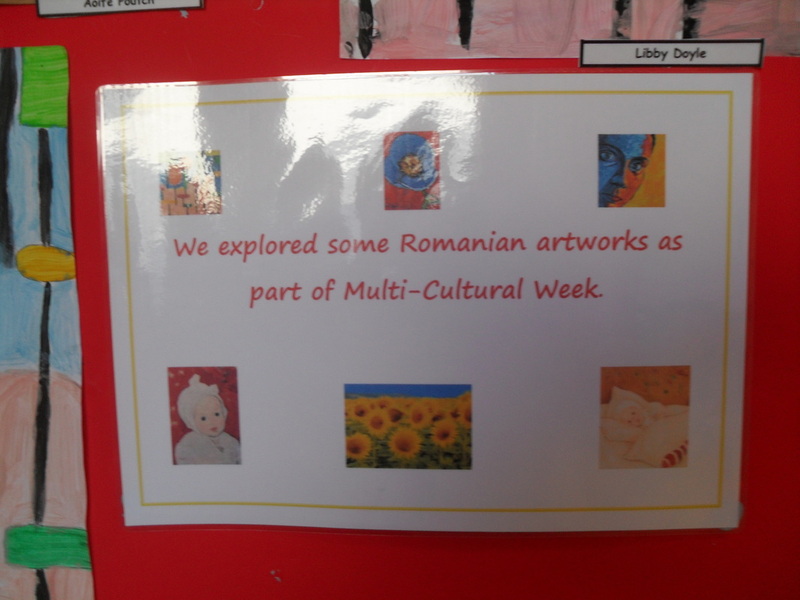 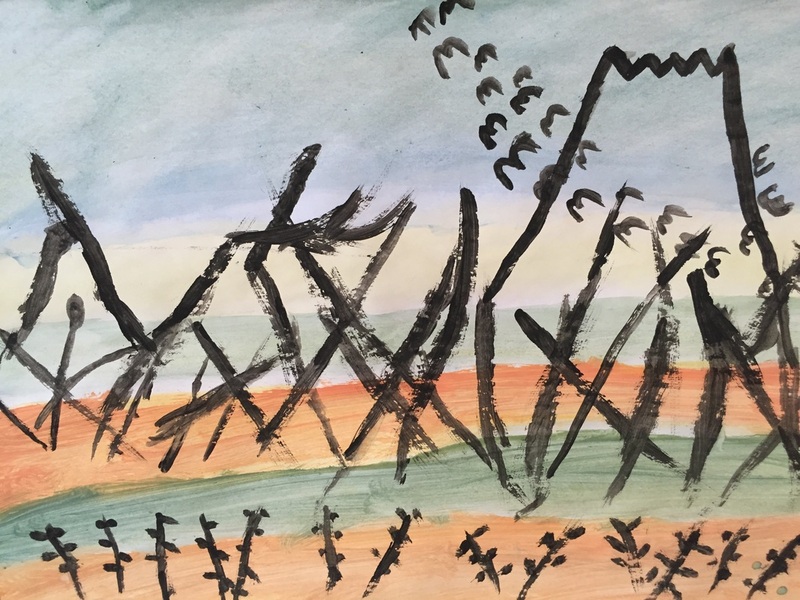 We had a great time exploring some Romanian artists as part of our work on Romania. 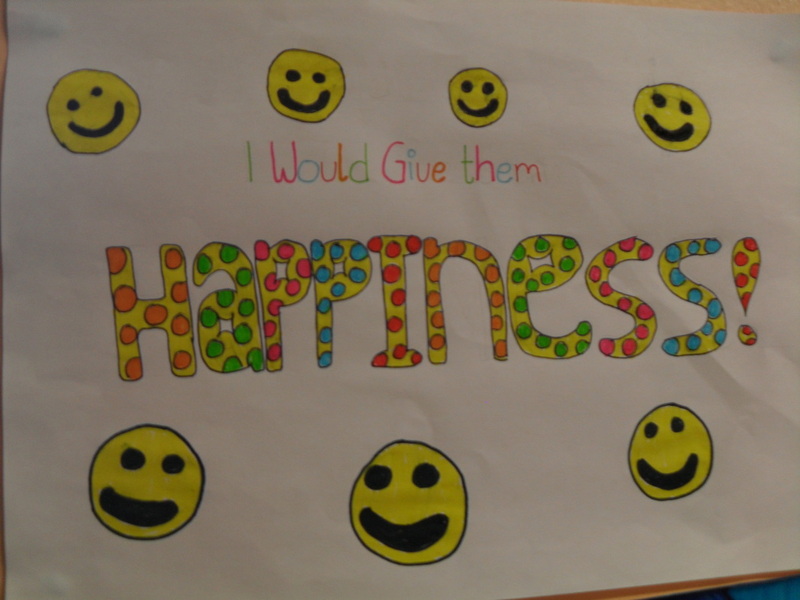 'What would you give someone who had everything?' 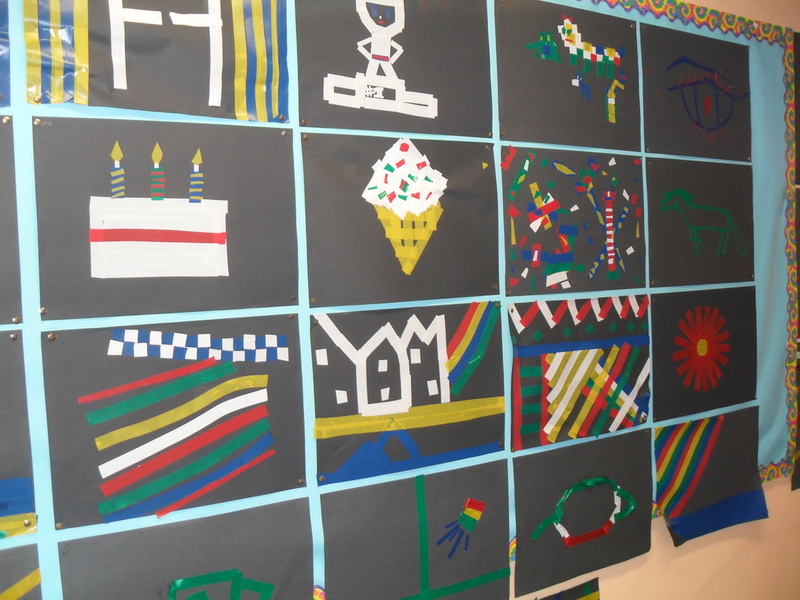 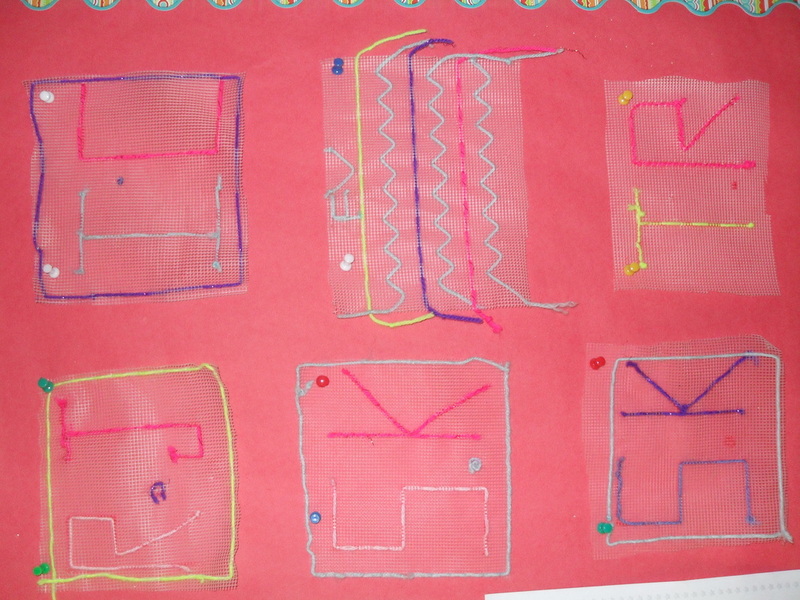 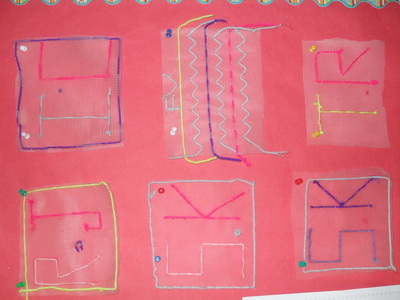 and 'Tape Art' created in November 2014. 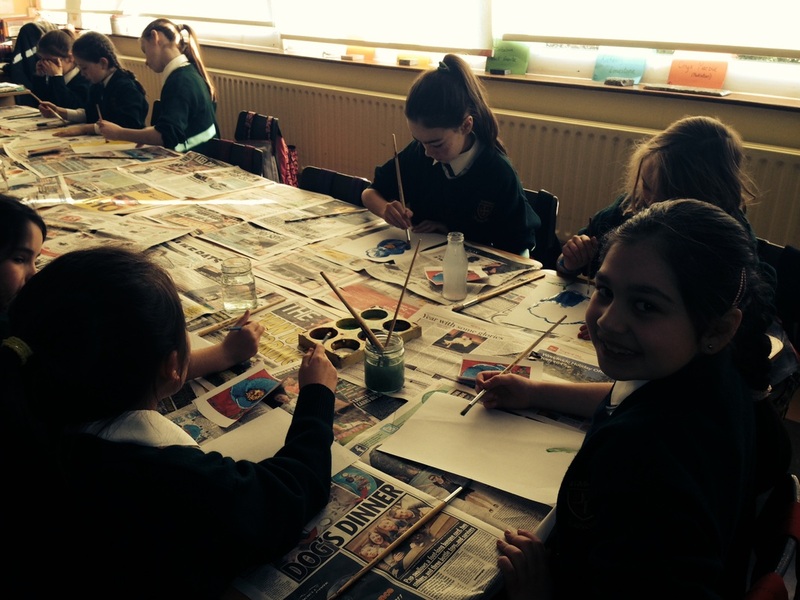 We looked at the work of Irish artist, Paul Henry. 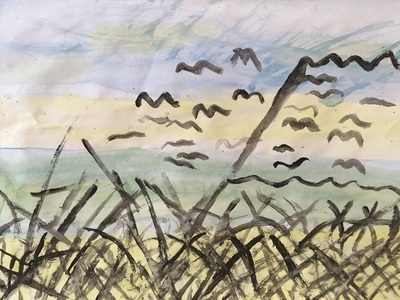 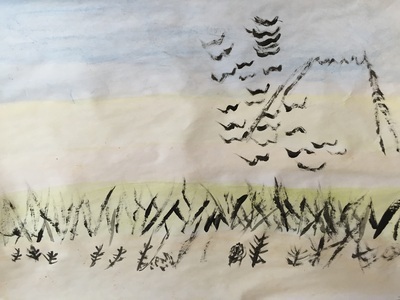 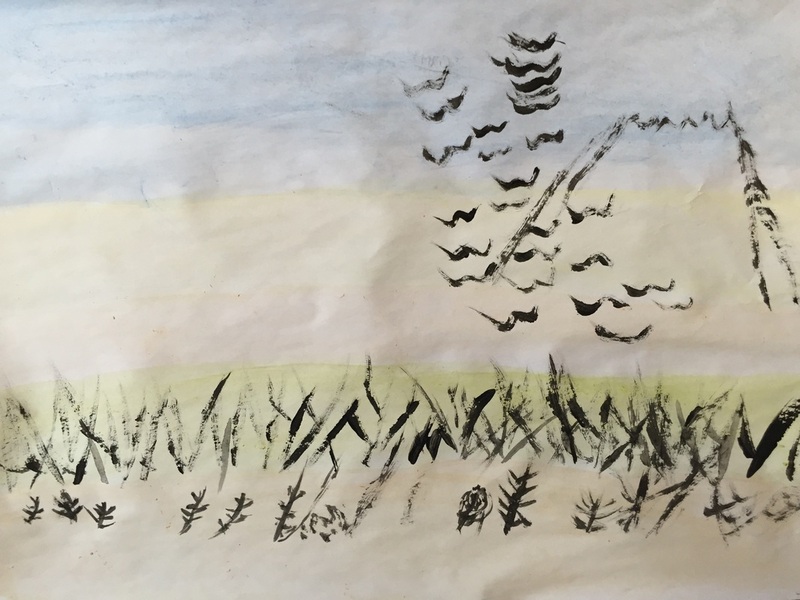 We took a closer look at Lakeside Cottages, where we can see the artist's love of big skies and simple lines. The children enjoyed learning about why the cottages had small windows and half-doors. 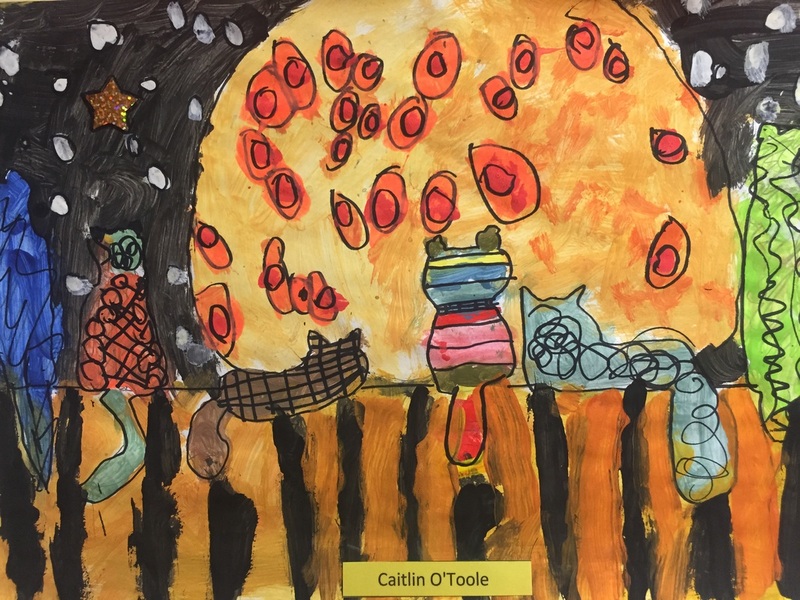 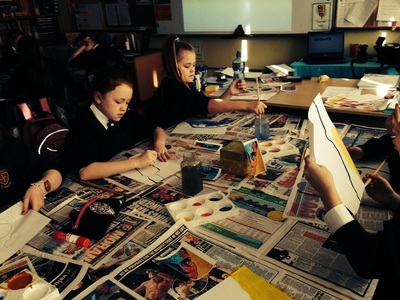 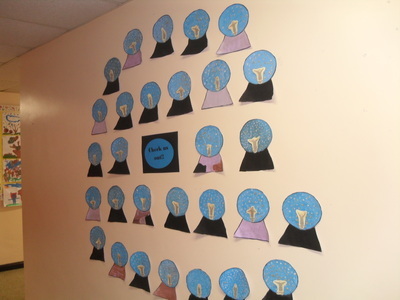 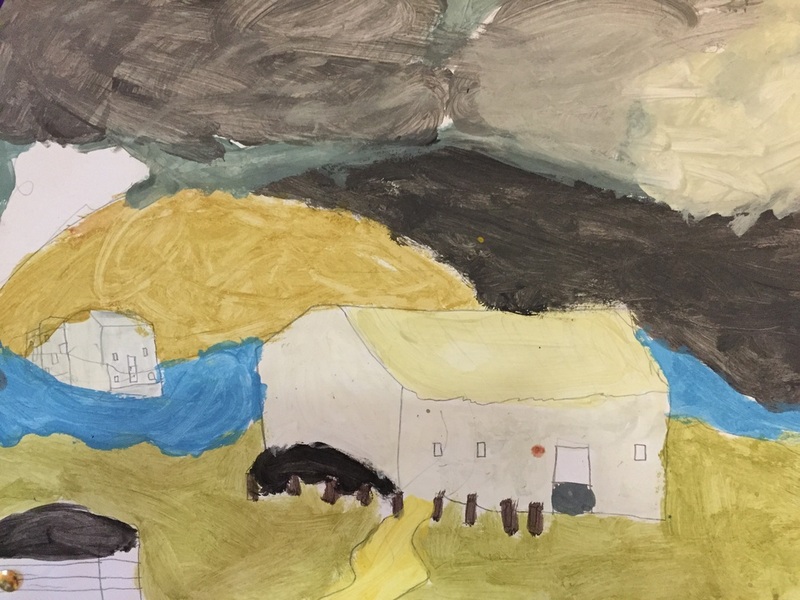 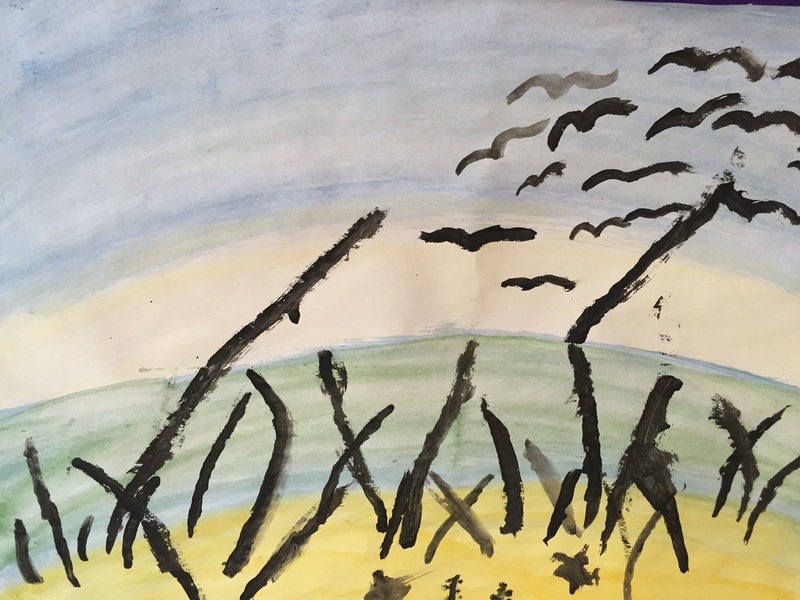 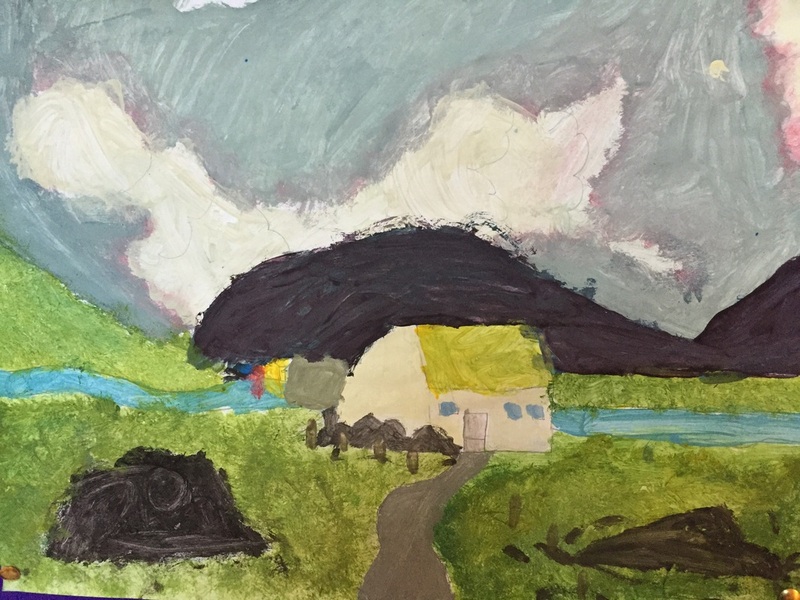 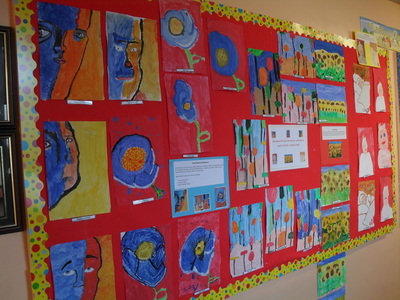 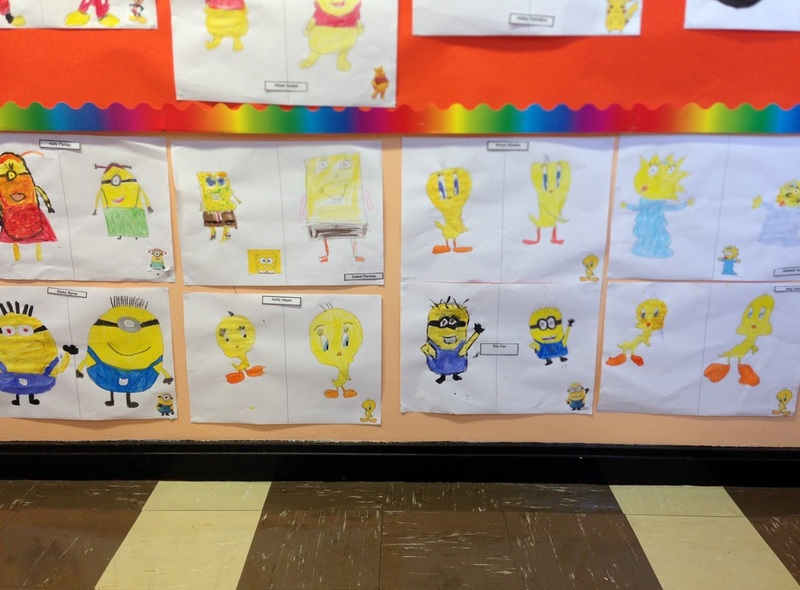 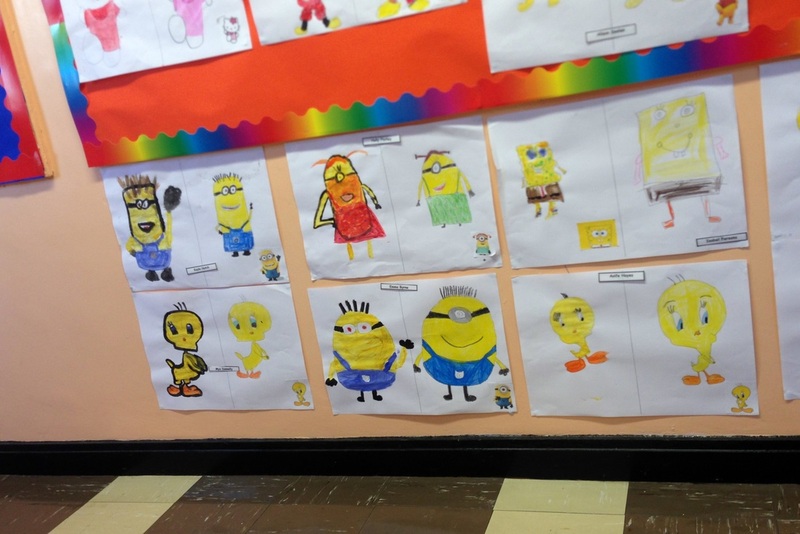 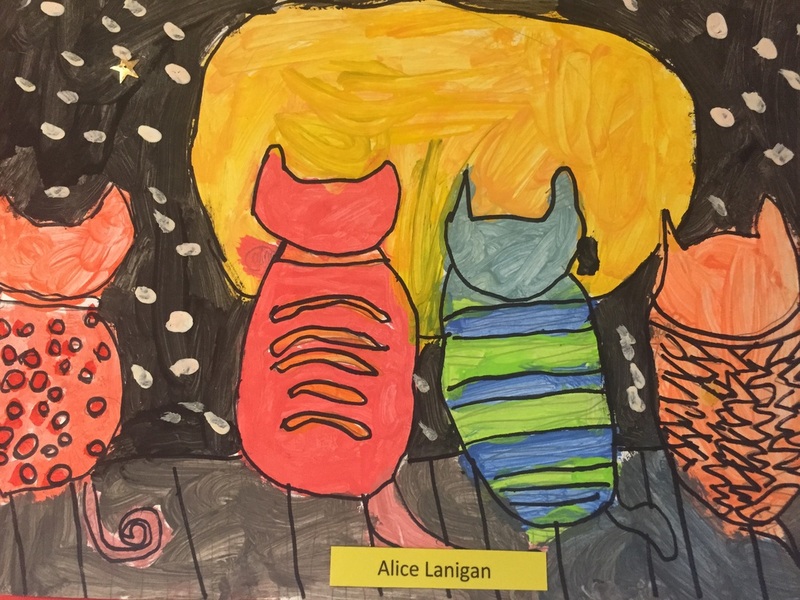 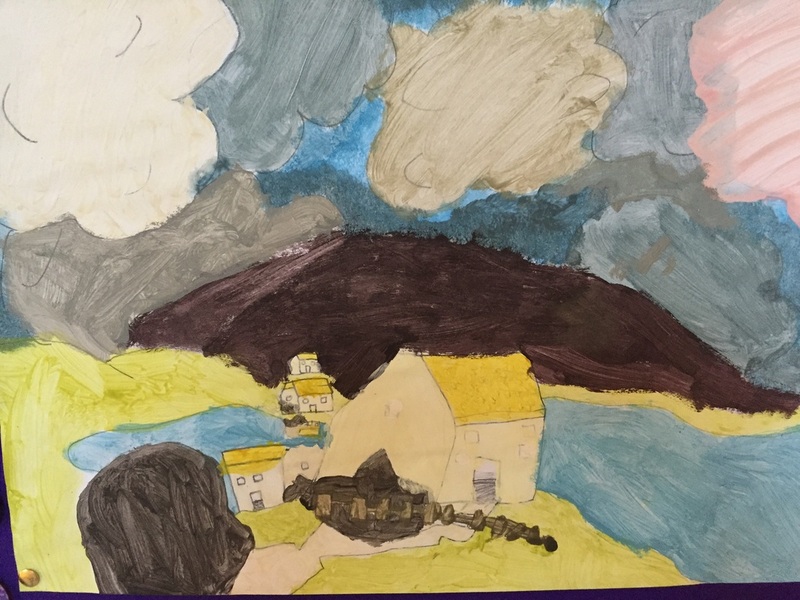 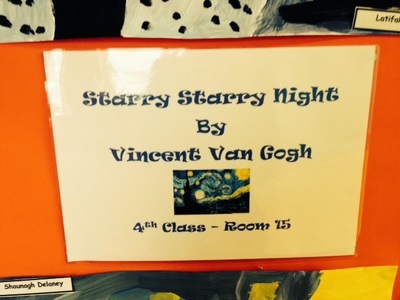 Ms Devlin's fourth class have been studying Vincent Van Gogh and some of his works. 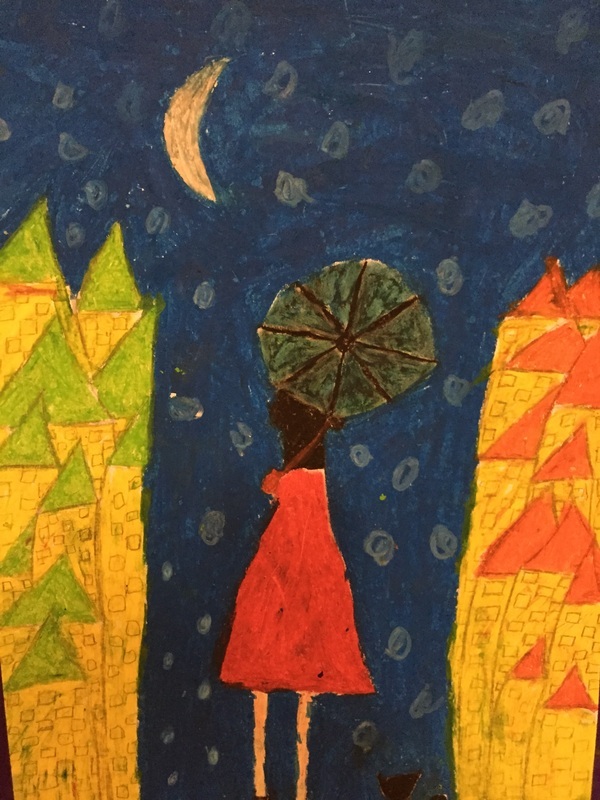 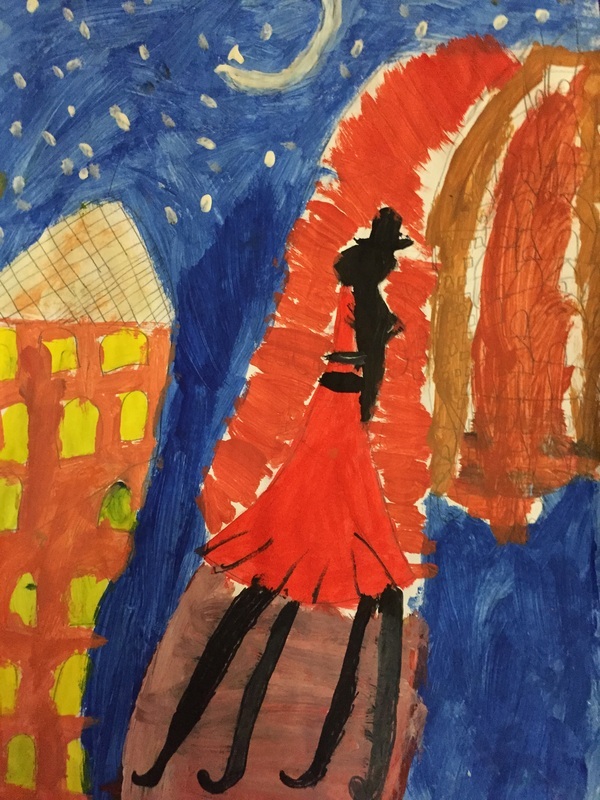 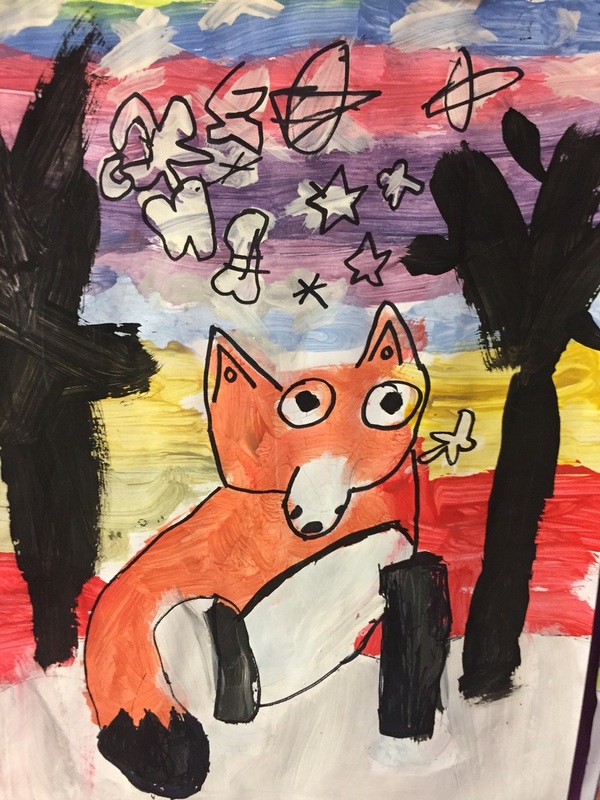 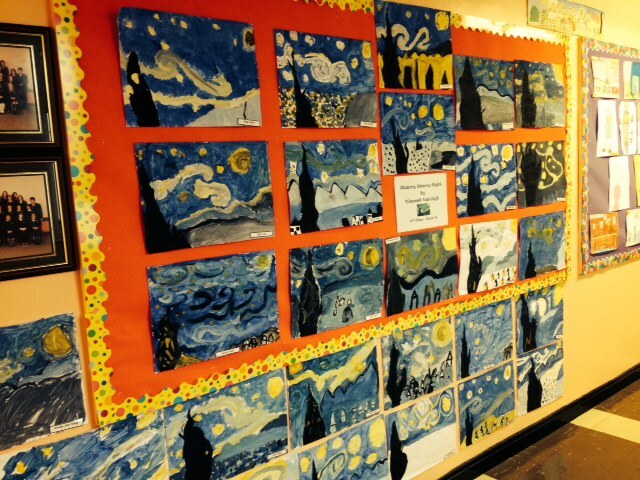 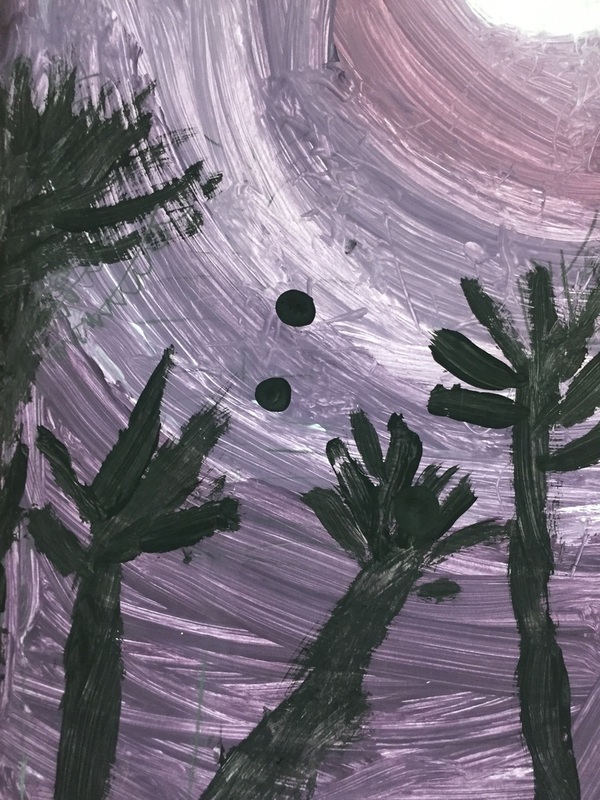 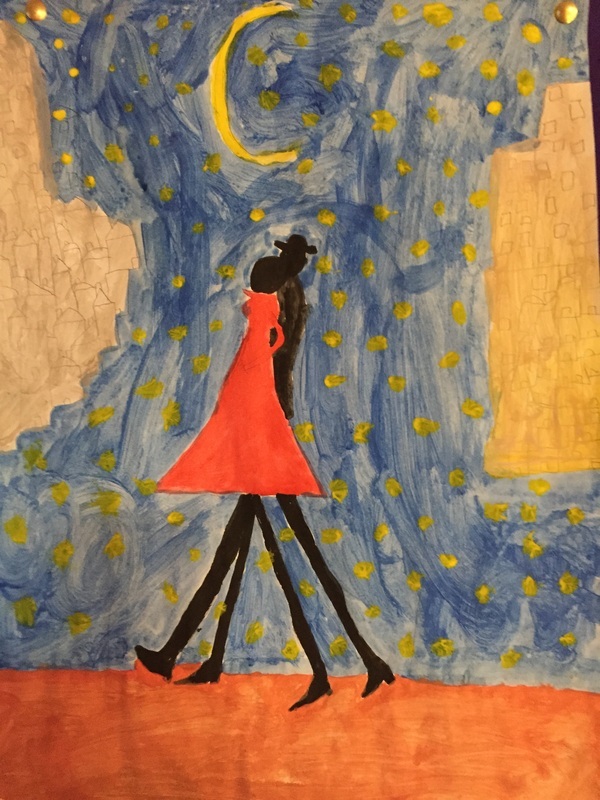 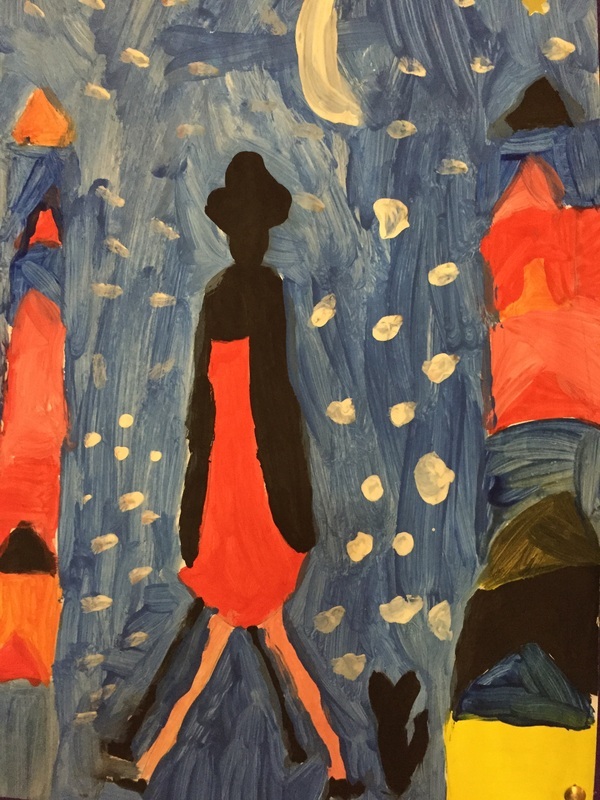 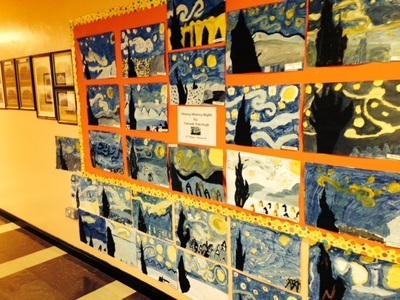 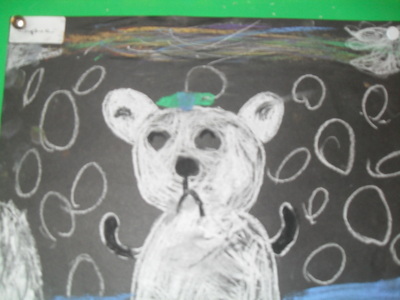 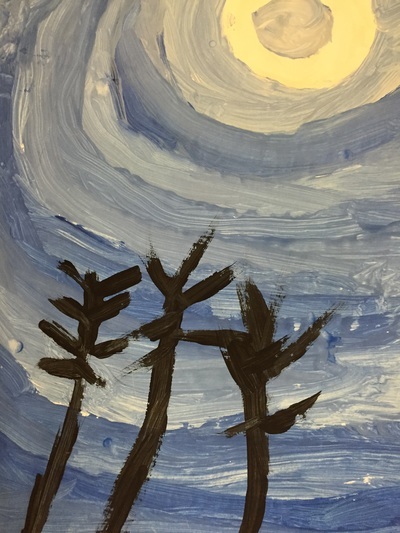 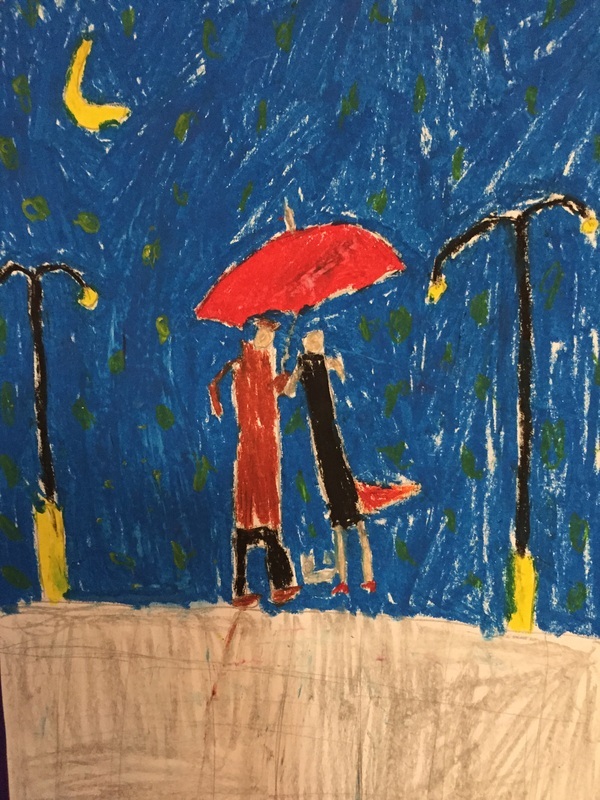 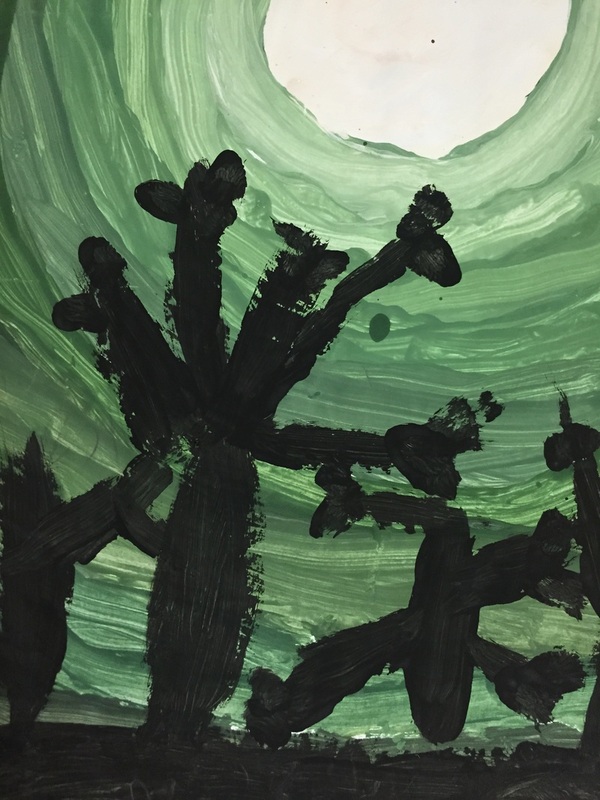 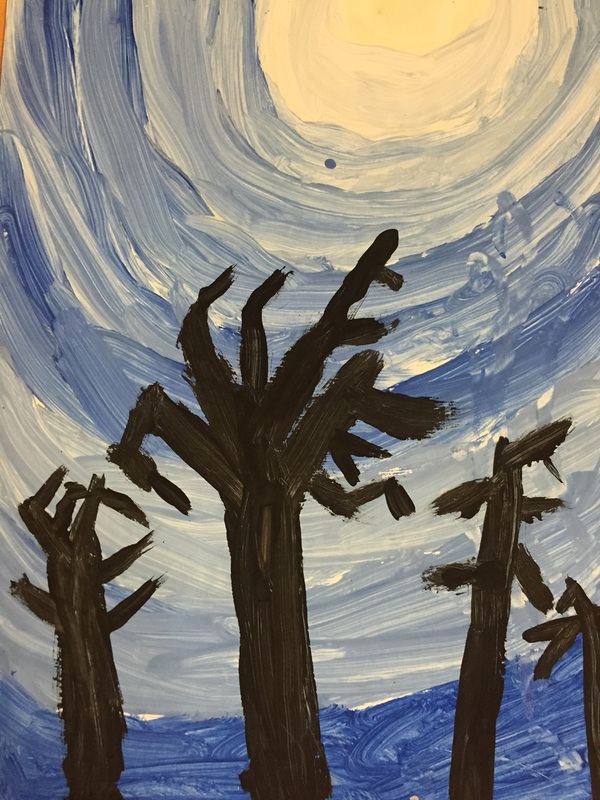 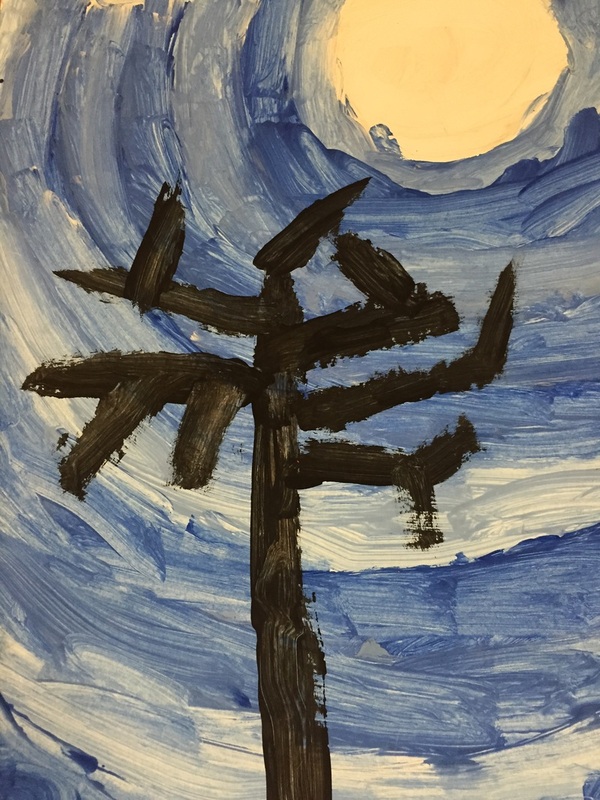 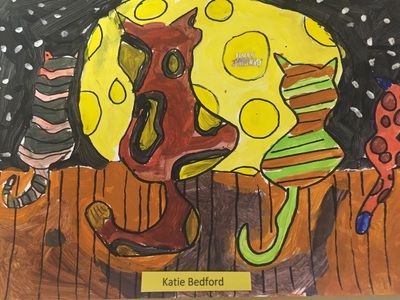 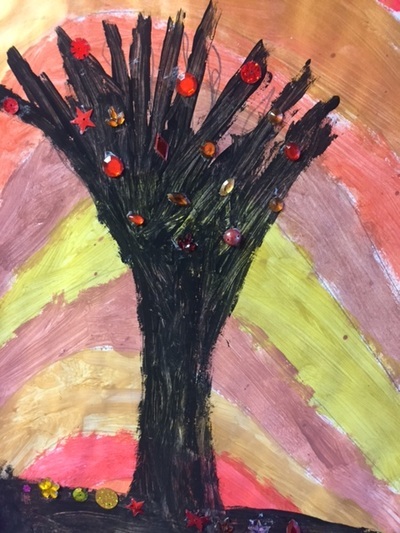 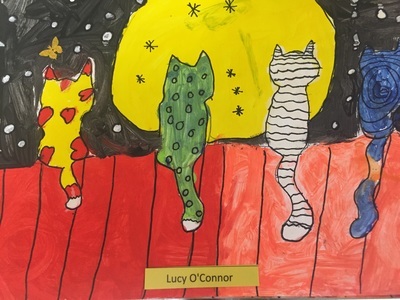 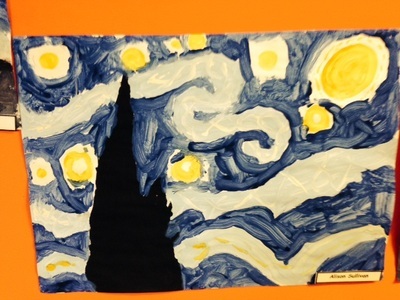 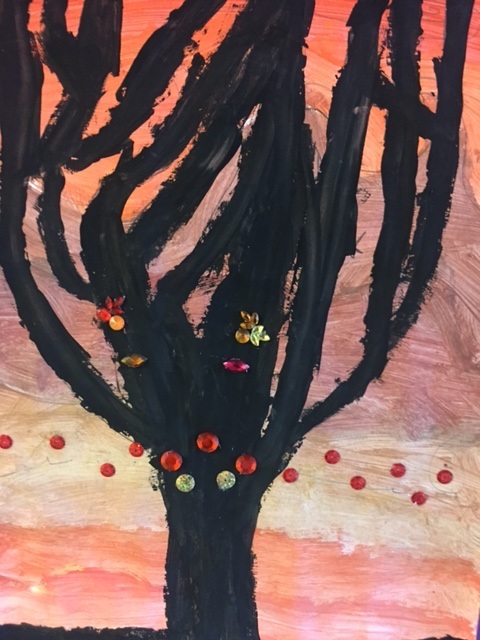 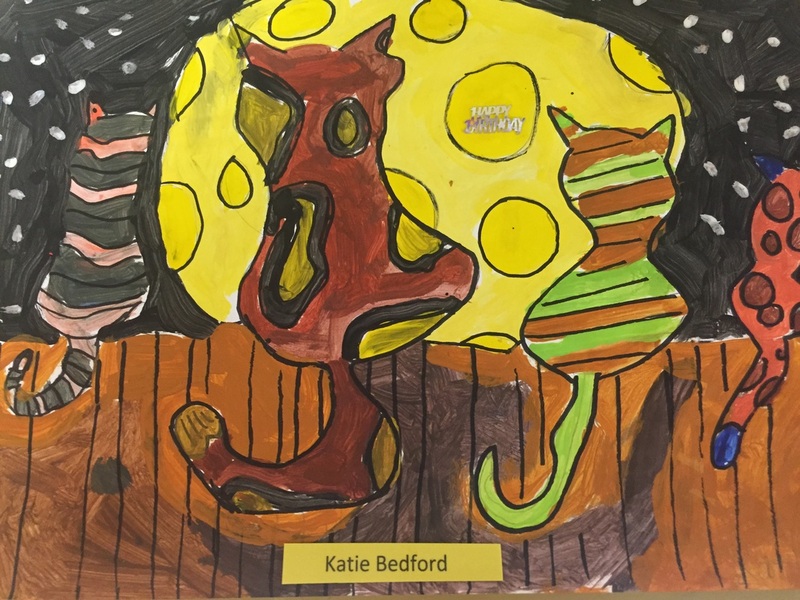 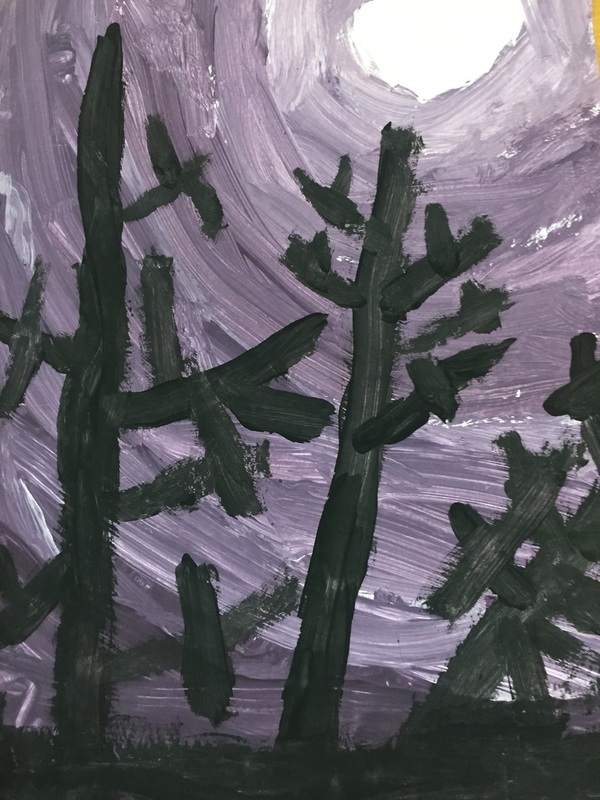 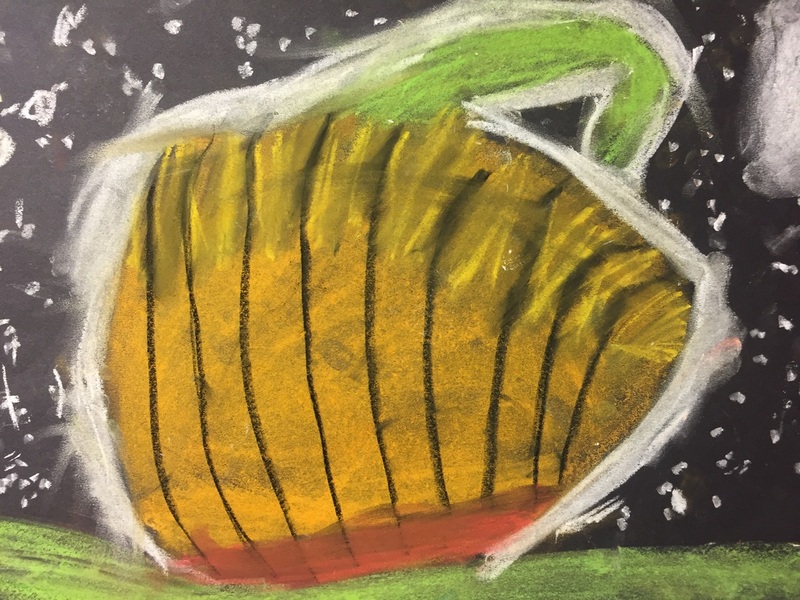 We really enjoyed painting 'Starry Starry Night' which is one of his well known pieces. 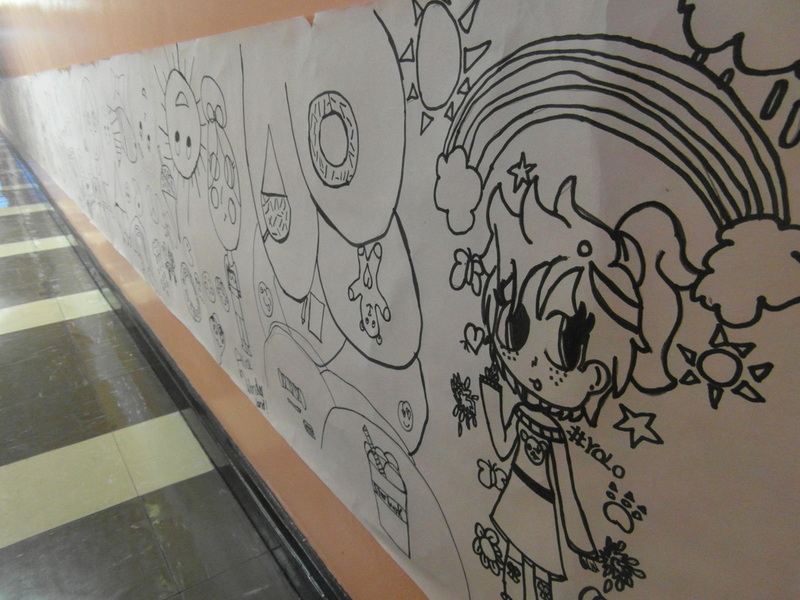 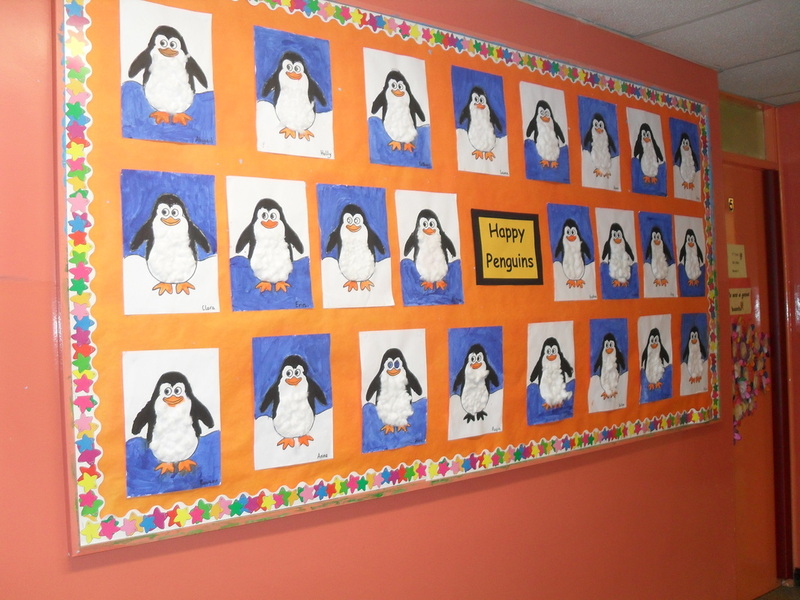 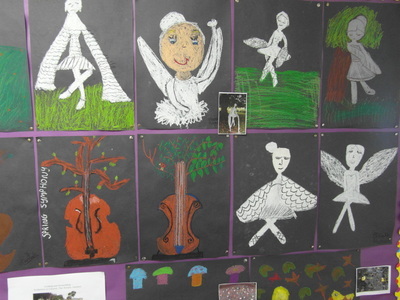 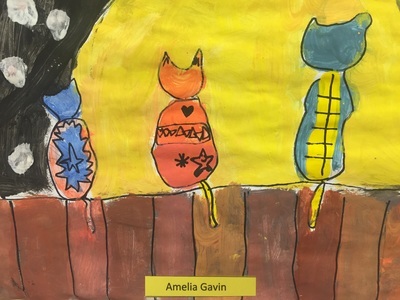 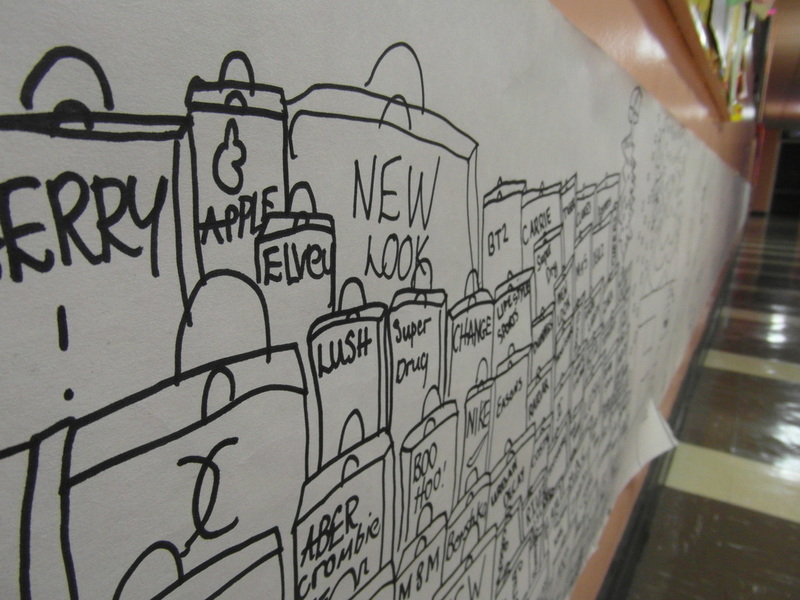 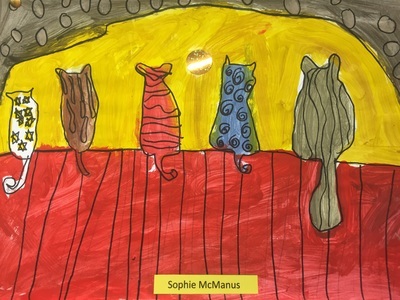 Artwork on the Junior Corridoor, November 2014.